Connor Wile (#3) is met at home by his teammates in the fifth inning after a long home run. 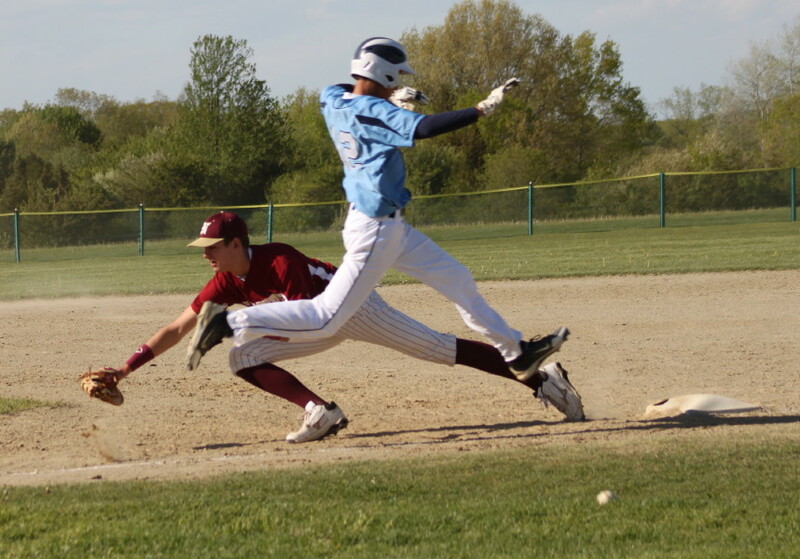 (Newburyport) You get these mismatches occasionally in the early rounds of the MIAA baseball tournament. And that’s what this was as Newburyport easily defeated Charlestown, 11-0, on a seriously hot Friday afternoon at Newburyport. The victory gets Newburyport (14-7) to the North Division 3 quarterfinals. They will face the winner of tomorrow’s North Reading/Swampscott game probably on Monday. The Clippers essentially put this game away in the second inning. 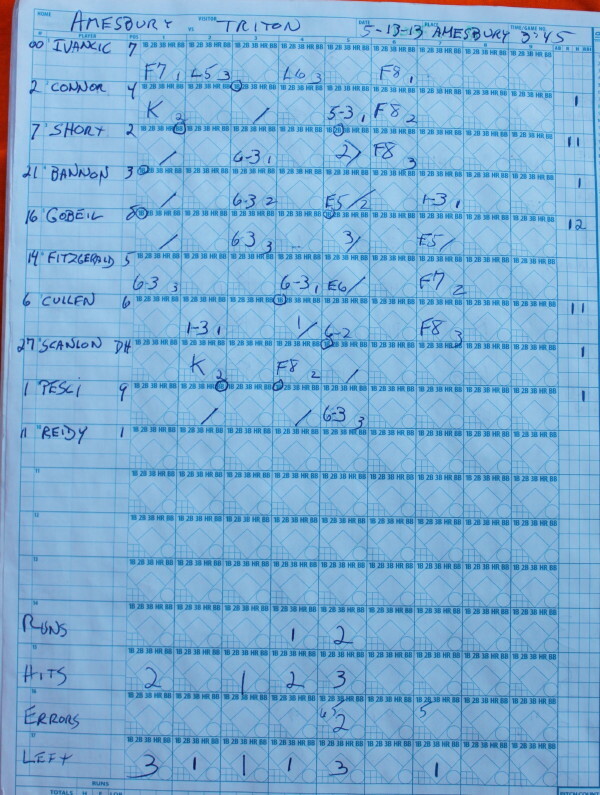 In that frame, two walks, three hits, and four errors combined to enable the home team to collect seven runs. 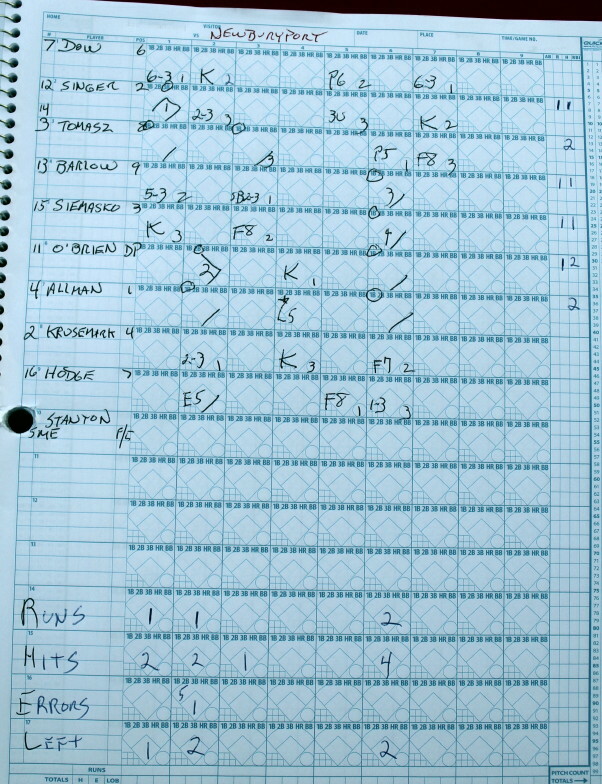 Newburyport sent twelve batters to the plate in that inning. 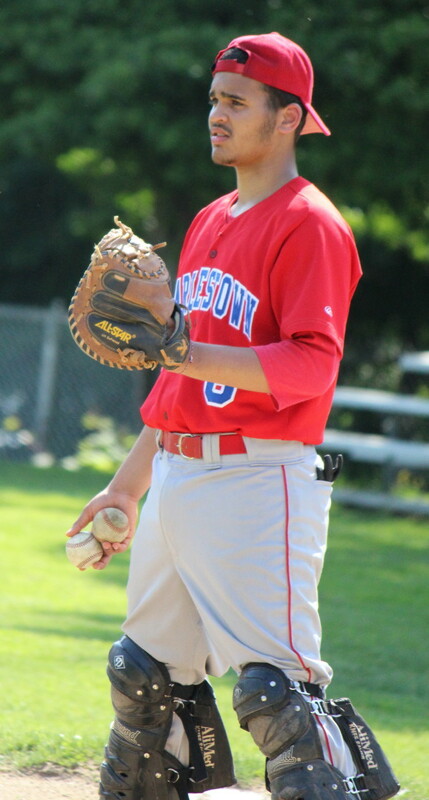 Starter Connor MacRae and two relievers (Leighton Paradis and Cameron Beaulieu) combined for a two-hit shutout. Connor went five innings to notch his 6th win of the season. 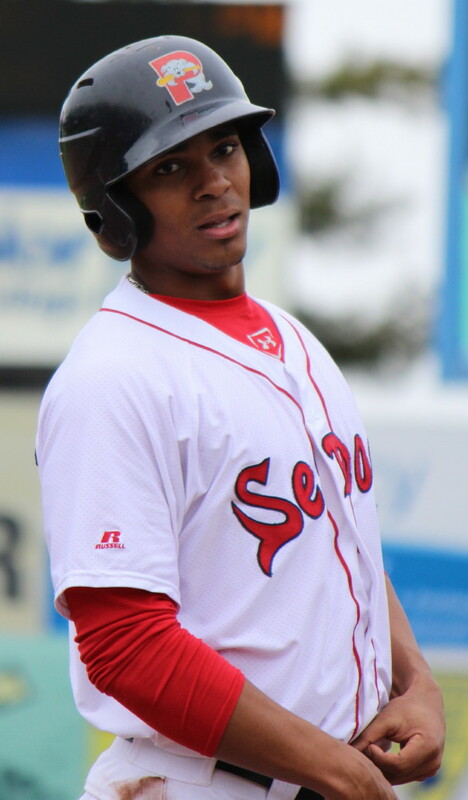 Newburyport hit Townies starter Luis Atiles hard totaling eleven hits. The one hit they’ll be talking about for a while was Connor Wiles’ blast over the right centerfield fence in the fifth. Connor took a long look at the shot that appeared headed for Hope Community Church on Hale Street. Connor’s homer was the end of a four-run fifth. Brian Fiascone drove in two of the runs with a shot to the leftfield corner. Colby Morris added the other with an infield groundout. 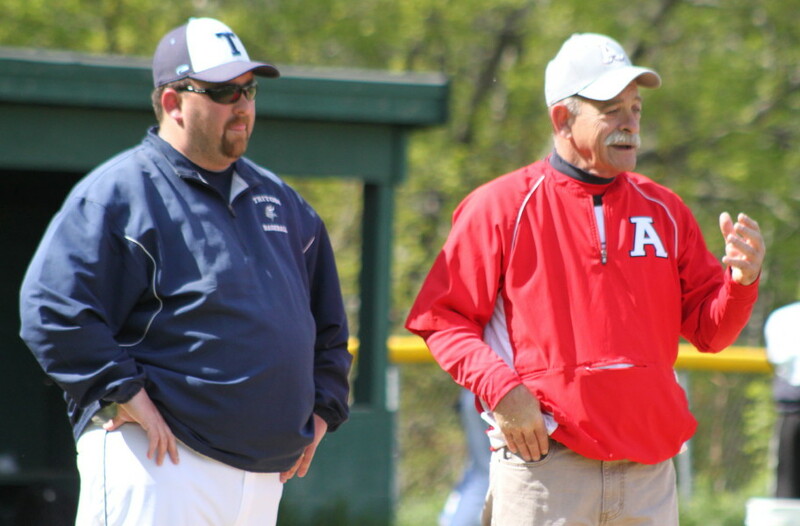 NHS coach Steve Malenfant took away the bunt and the steal after the seven-run second in an act of sportsmanship that sets a good example. He was also able to get every player in uniform into the game before it was over. 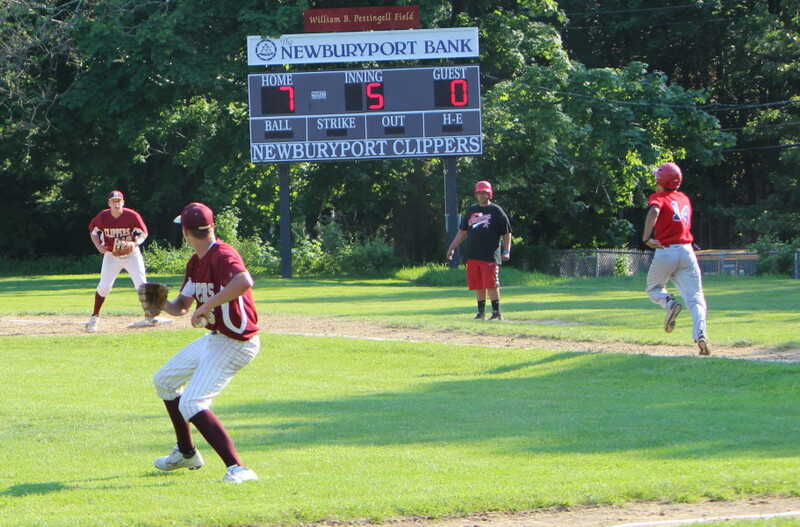 Connor Wile and Colton Fontaine each had two hits for Newburyport. 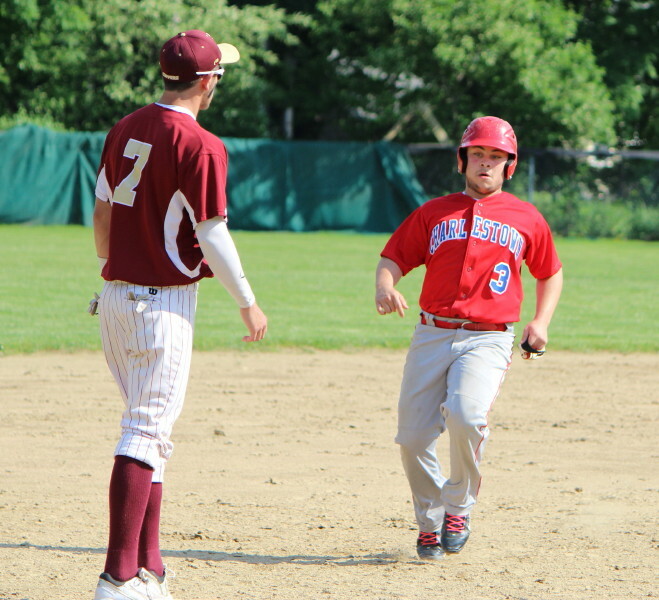 Brian Fiascone and Colton Fontaine each had two RBI. 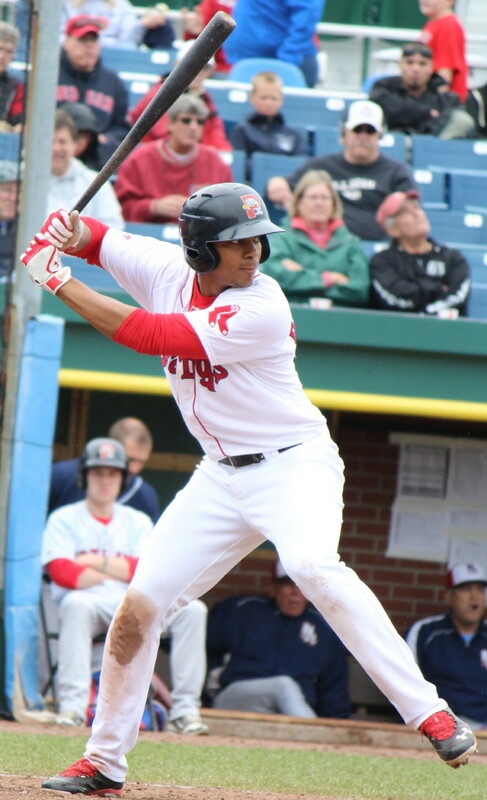 Ramon Pena had a single to right in the second inning. Donelle Dunn had an infield single with two outs in the seventh inning. 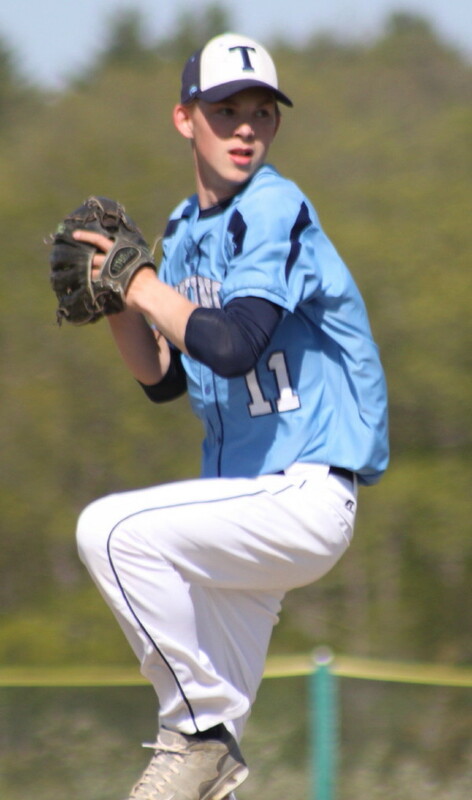 Connor MacRae went five innings for the win. Connor MacRae registered six K’s getting five of them looking. 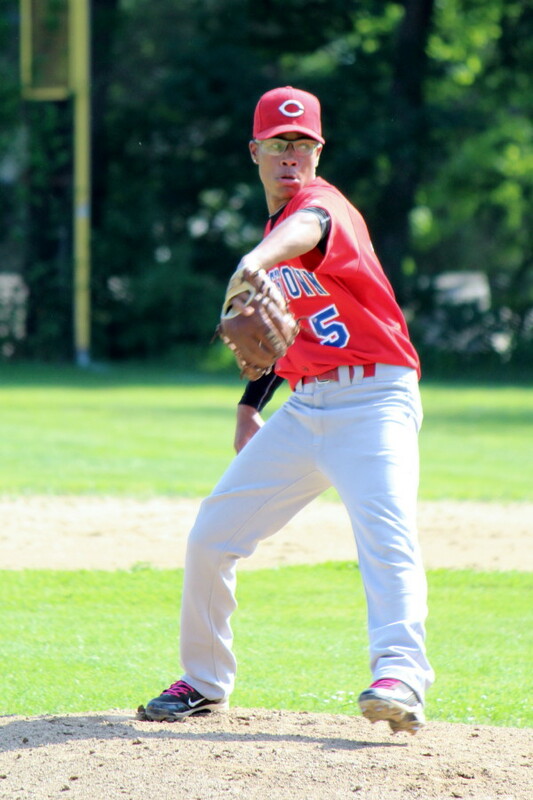 Jose Cordero pitched the final 1 1/3 innings for Charlestown. Charlestown certainly had the best dugout location………in the shade! 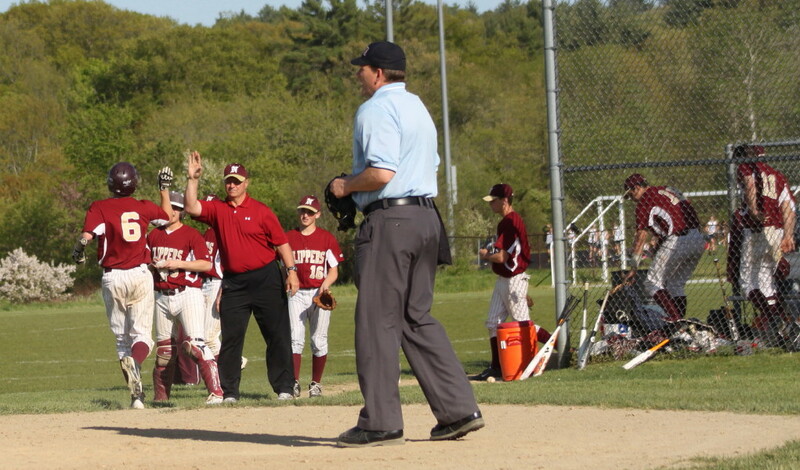 Newburyport has now won seven straight games since a 3-1 loss to North Reading on May 14th. A rematch with the Hornets would be very interesting. Ian Michaels started a double play. (Marblehead) Newburyport reached the Sweet Sixteen of Division 2 North with a tight, 4-3, win over Marblehead on a very hot Thursday afternoon. The Clippers (15-6) now gets a third try against Amesbury. This time in the D2 North quarterfinals on Saturday afternoon (3PM) at Amesbury Middle School. 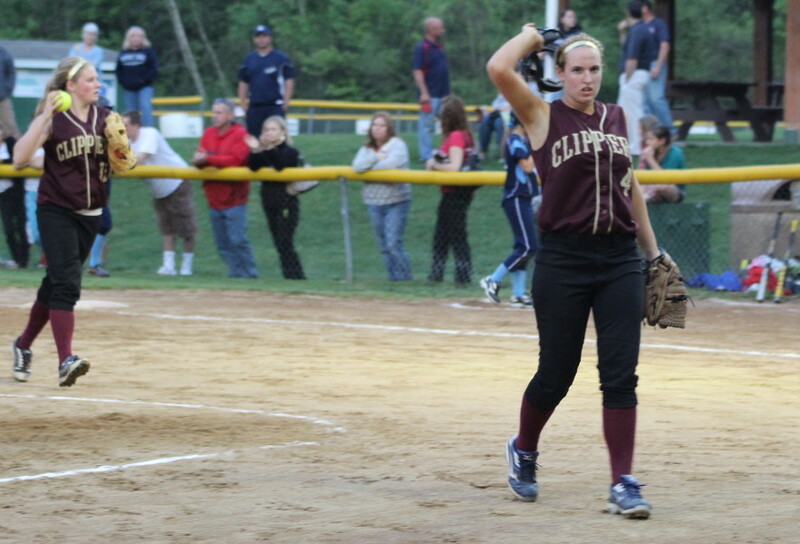 Vicki Allman pitched a complete-game, three-hitter for Newburyport in the do-or-die atmosphere of tournament play. The #10-seed Clippers put four of their nine hits together in the top of the sixth inning to collect two runs and get the lead (4-3) for good. Marblehead (#7 seed) threatened in the bottom of the seventh. 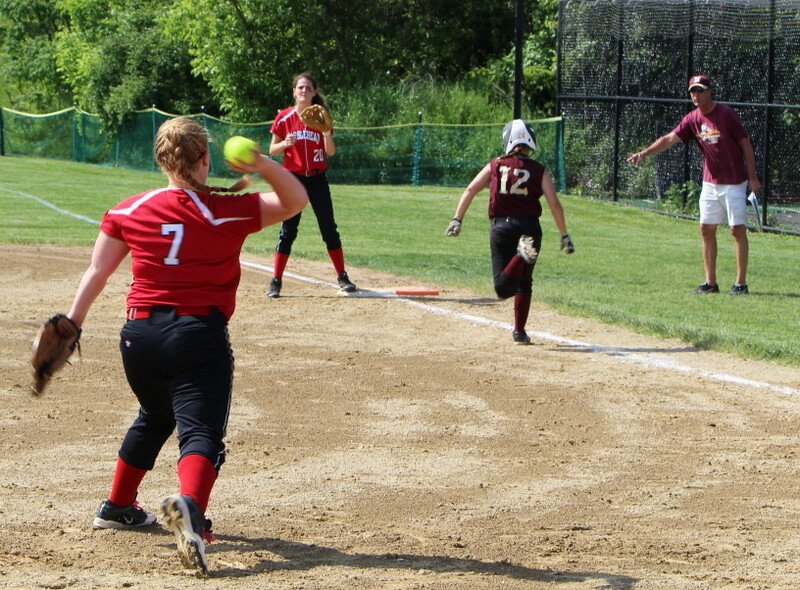 Pinchrunner McKenzie Joyce stole second with two outs but Vicki Allman got Emily Promise to foul out to first baseman Carley Siemasko to end the threat and Marblehead’s season. Newburyport jumped in front with a run in the first. 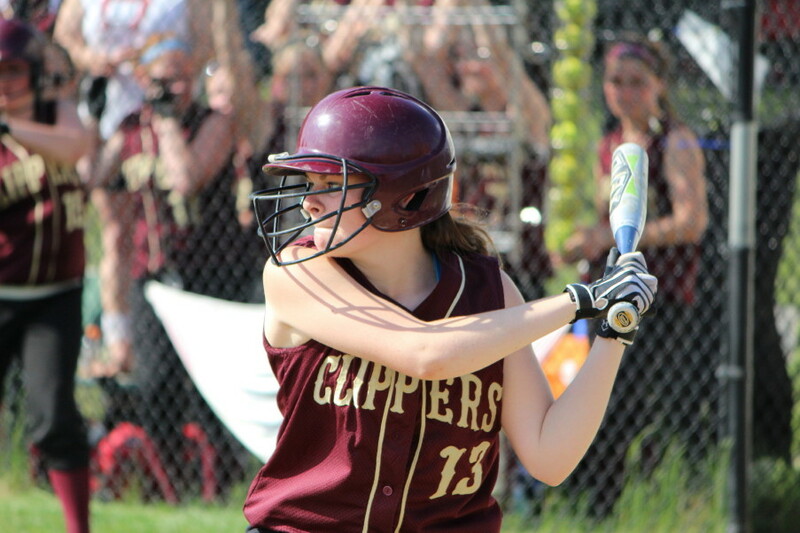 Lauren Singer drilled a triple off Magician past leftfielder Allison Kapoll. Lea Tomasz singled through the hole between short and third driving Lauren home. 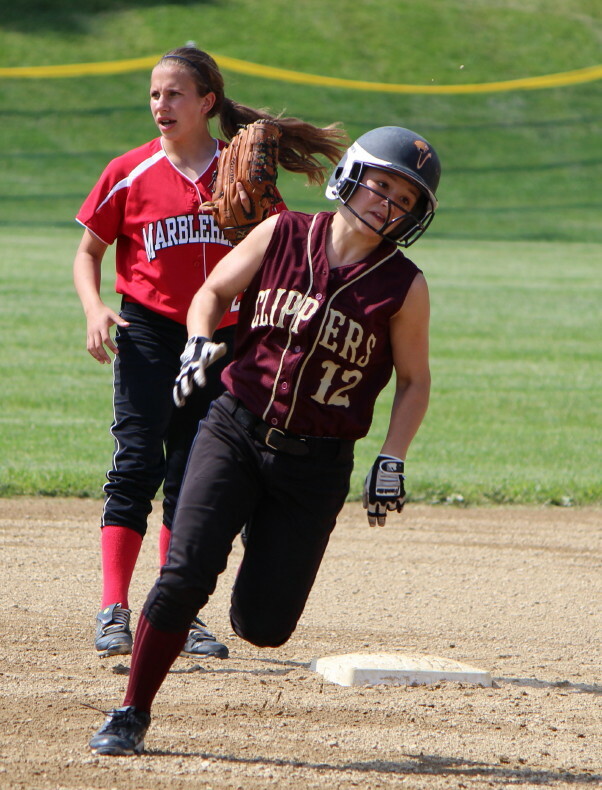 Marblehead (14-7) didn’t get a hit until the fourth inning but that didn’t stop them from getting two runs in the first off a very shaky Newburyport defense in their half of the first inning. A two-out bobble by shortstop Kendra Dow extended the inning. Two batters later, leftfielder Ashley Hodge dropped a fly ball allowing both Anistasia Vainis and McKenzie Joyce to score. Things got a little weird in the Clippers half of the second inning. 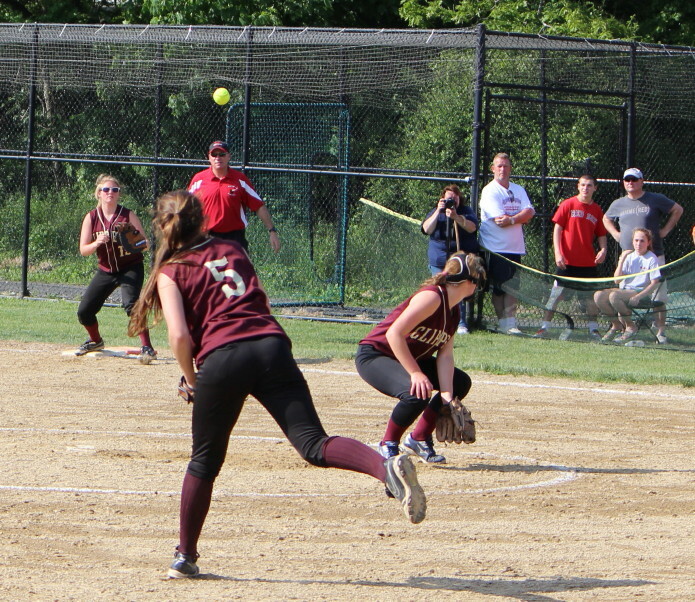 Newburyport loaded the bases (a Sarah Bornstein error was in the mix) with one out. Kendra Dow struck out but catcher Emily Messinger dropped the ball and Shelby O’Brien scored from third (barely…….Why didn’t she slide?) to tie the score at 2-2. 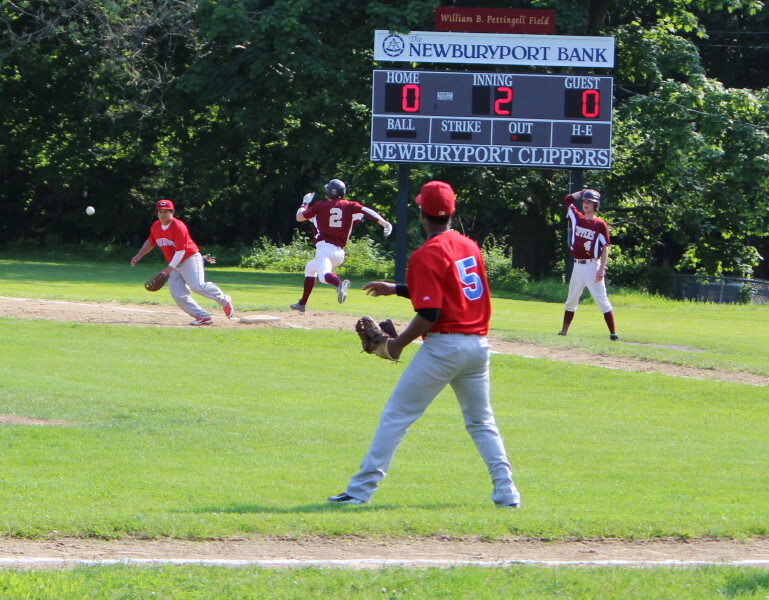 Two more Clippers errors in the Marblehead fourth put the Magicians up by a run. Centerfielder Lea Tomasz tried for a two-out shoestring catch but Rachel McKay’s line drive got past her enabling Rachel to reach second. 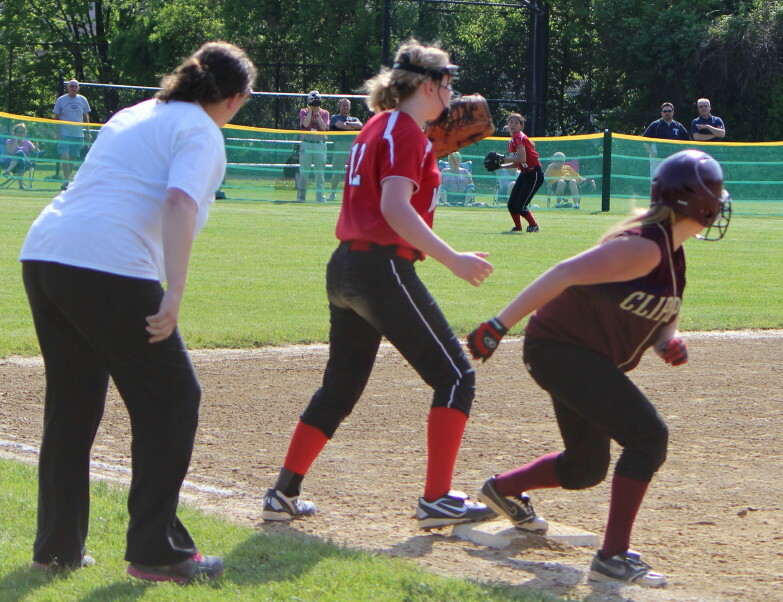 Third baseman Meghan Stanton then threw away Alexa Brown’s grounder allowing Rachel to cross with Marblehead’s third run. That run started to look like a game-winner after the Clippers went quietly in the fifth and then made an out to start the sixth. 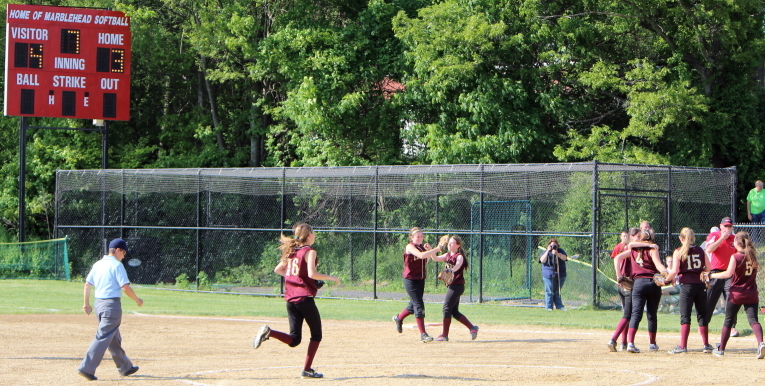 However, Newburyport then had consecutive singles by Casey Barlow, Carley Siemasko, and Shelby O’Brien to tie the score. Shelby sent a 2-strike pitch to center for the RBI. Another single (Vicki Allman) loaded the bases with one out. 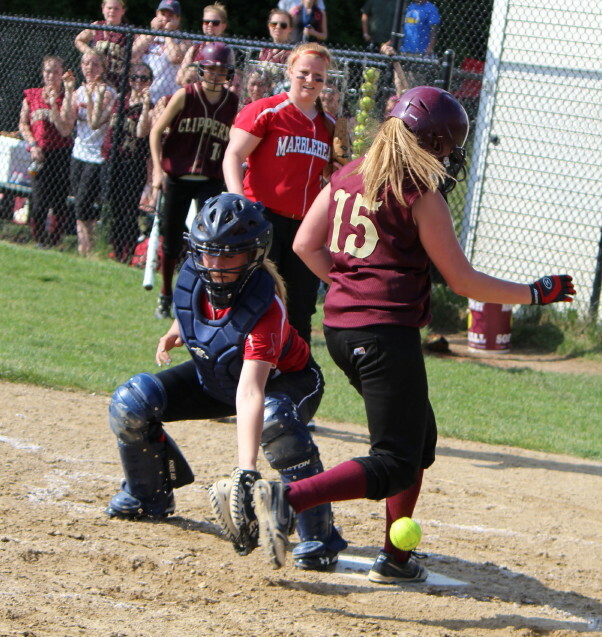 Jackie Krusemark’s fly ball delivered Carley Siemasko from third (barely……Why didn’t she slide?) 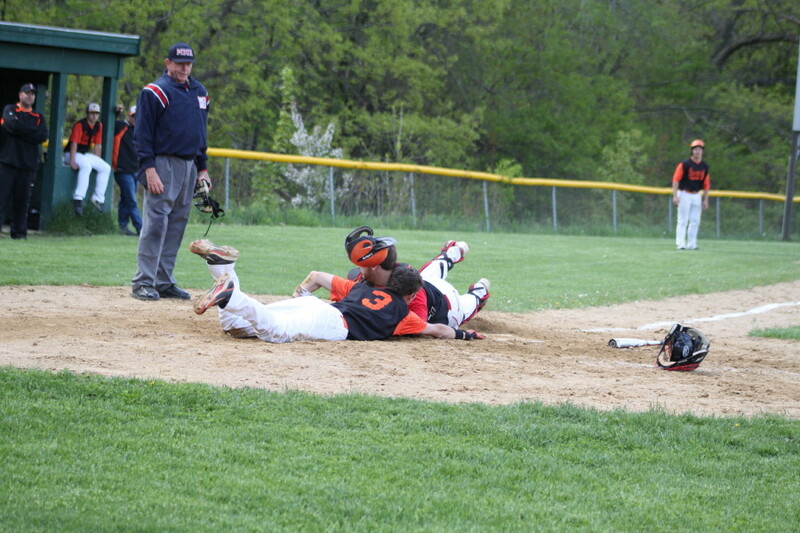 with what turned out to be the winning run. 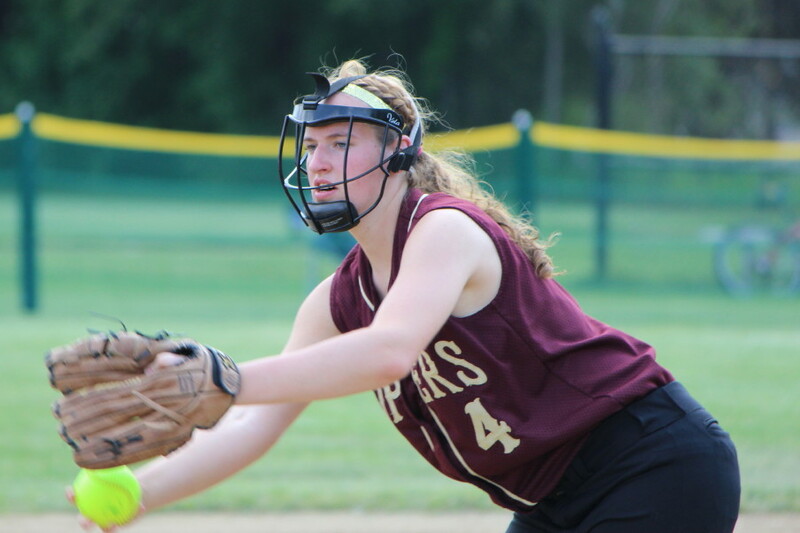 Lea Tomasz, Shelby O’Brien, and Vicki Allman had two hits each for Newburyport. 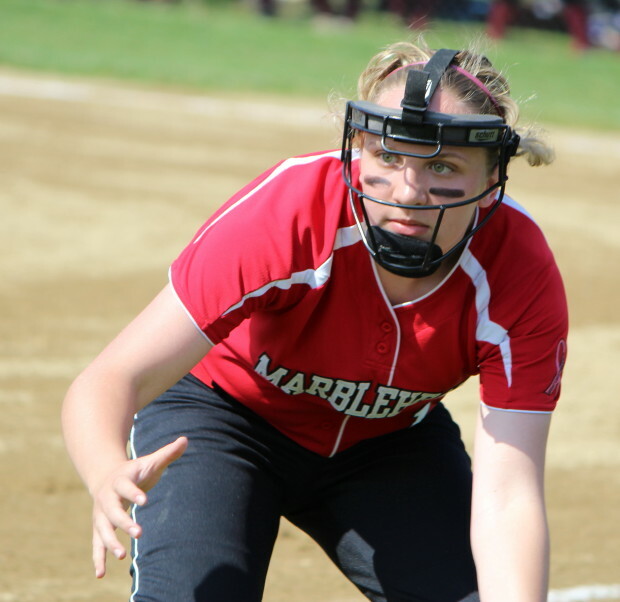 Rachel McKay had two hits for Marblehead. Michaela Leblanc was ruled out for interference leading off the fourth inning. Catcher Lauren Singer’s throw on a bunt hit Michaela in fair territory. Lea Tomasz was ruled out on an appeal play for leaving third base too early on a one-out fly ball in the third inning. 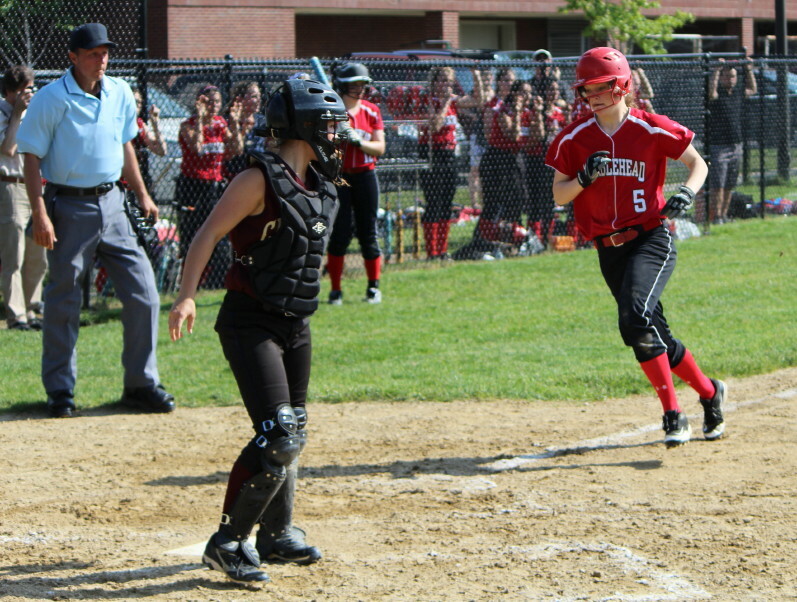 Third baseman Sarah Bornstein made a nice play on a line drive in the fourth inning for Marblehead. 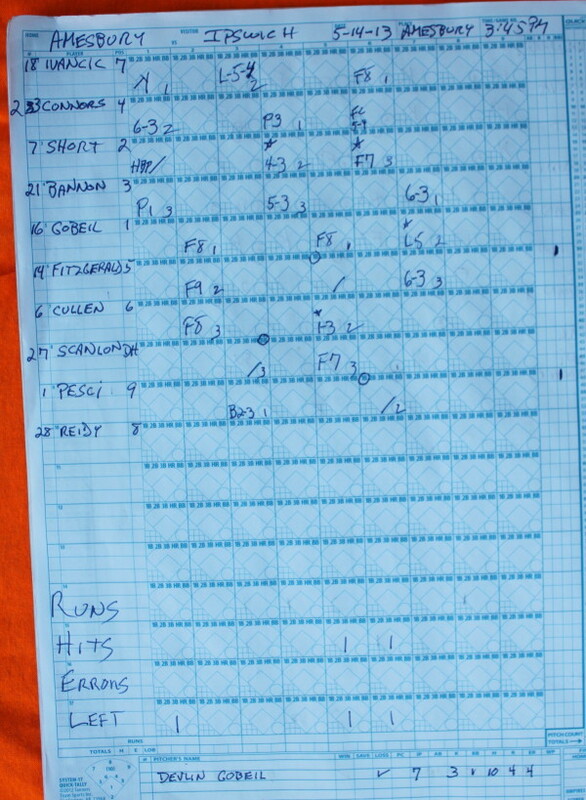 The game was delayed in the fifth inning as Lauren Singer was tended to. There was a breeze but the heat (high 80’s) was oppressive. The playing field at the middle school was in excellent condition. 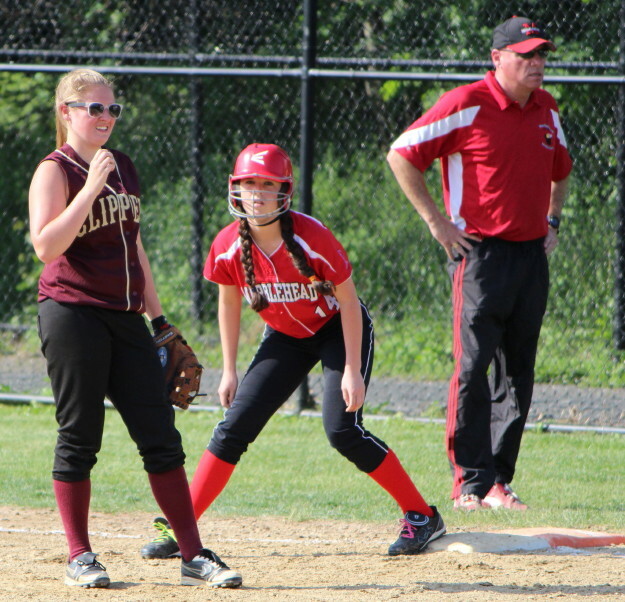 Yes, there were two Newburyport infield errors, but they also handled eleven other infield chances flawlessly. 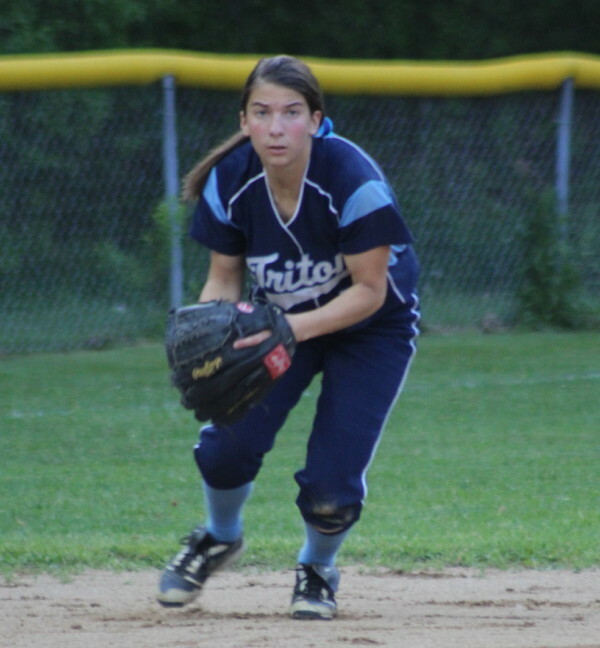 Emily Messinger popped out to first baseman Carley Siemasko all three times she batted. 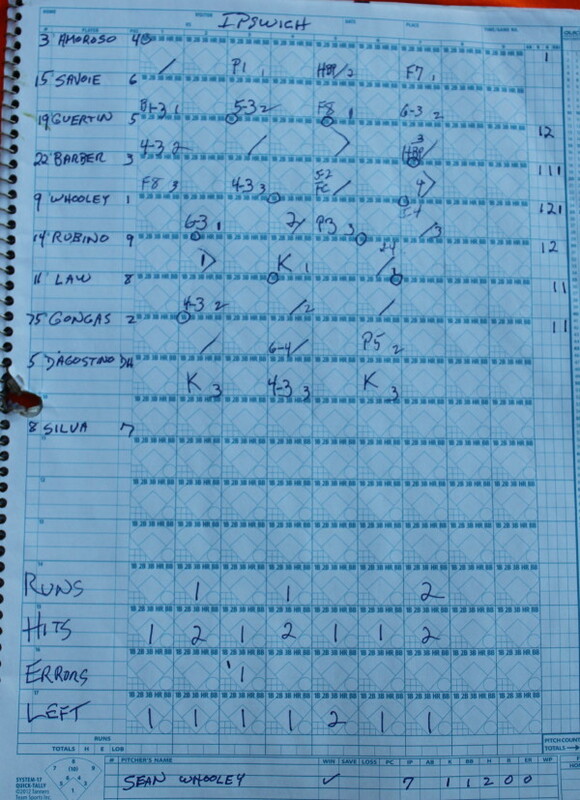 A big play in this game was in the final inning. 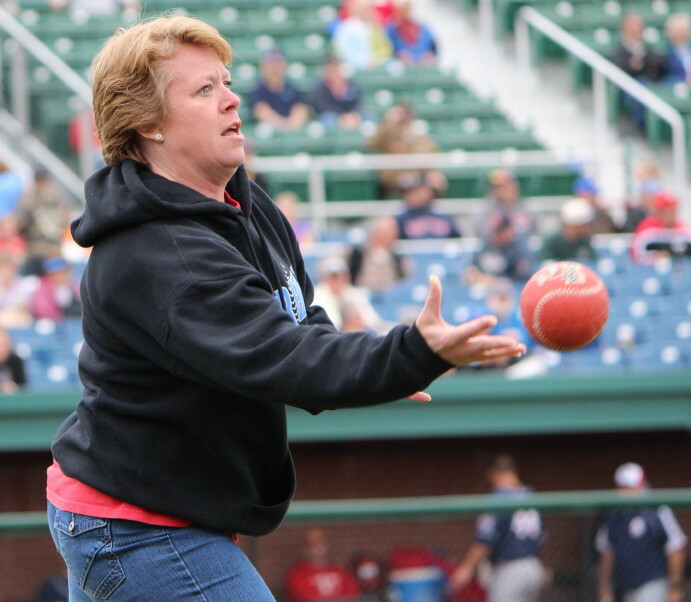 After Rachel McKay singled, Alexa Brown hit a grounder past pitcher Vicki Allman. 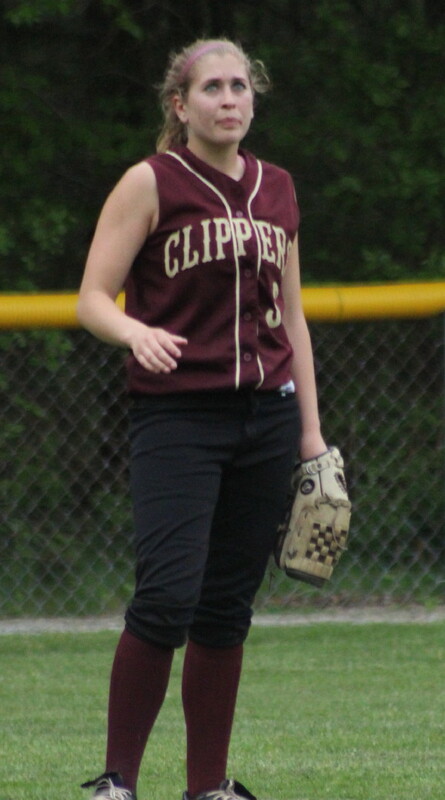 It looked like Newburyport trouble but shortstop Kendra Dow reacted quickly and got a force play at second. Two years ago I saw Marblehead eliminate Triton (at Triton) 7-1. 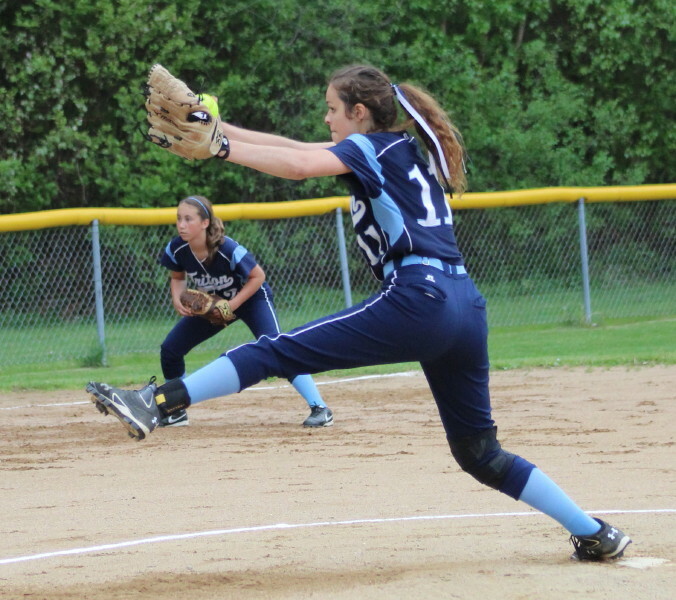 Michaela Leblanc pitched that day. 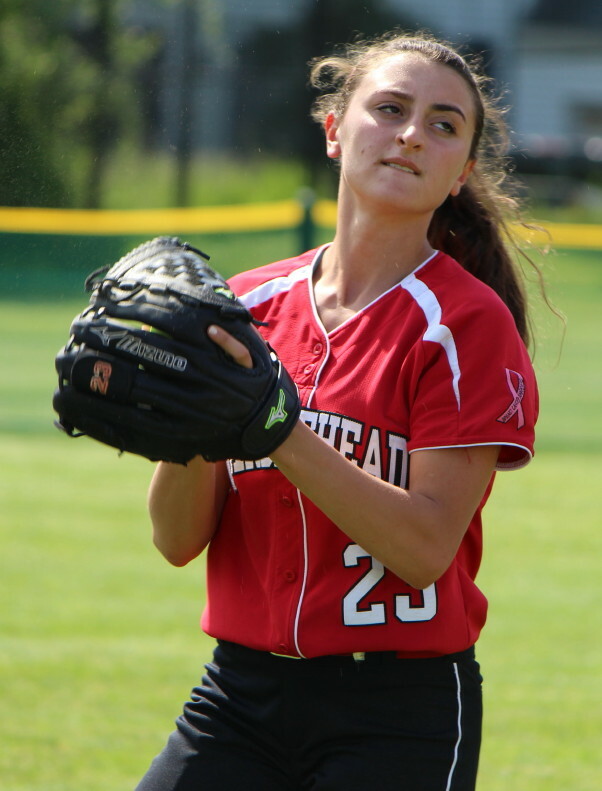 Junior Michaela holds the Marblehead school record with 32 wins. A very good North Reading team went out again in the opening round (5-2 to Reading). 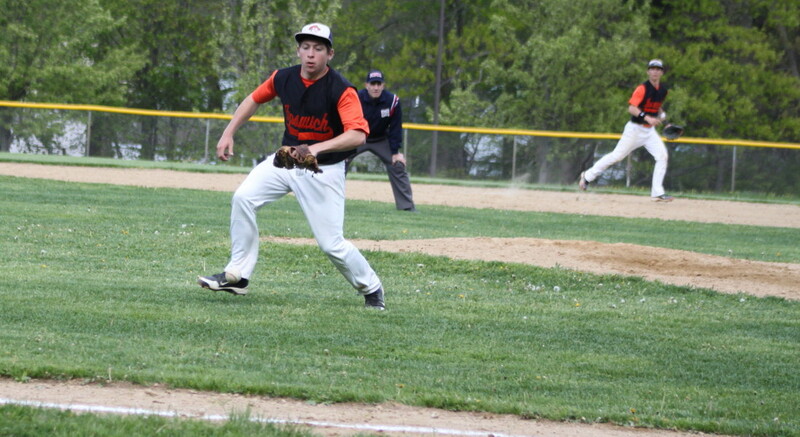 Last year the Hornets were the #1 seed and lost to Saugus after having the Sachems down, 5-1, in the last inning. Ouch! 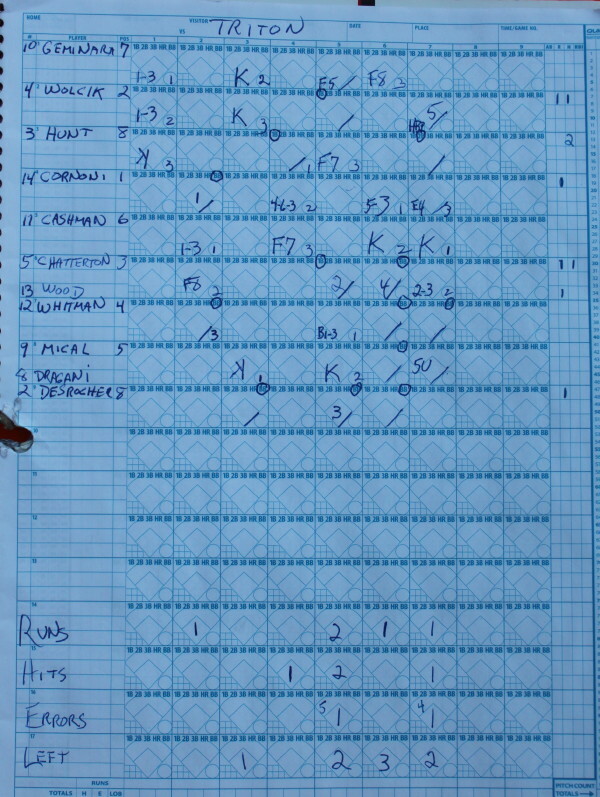 On May 1st, Amesbury put an 18-0 mercy rule game on Newburyport. 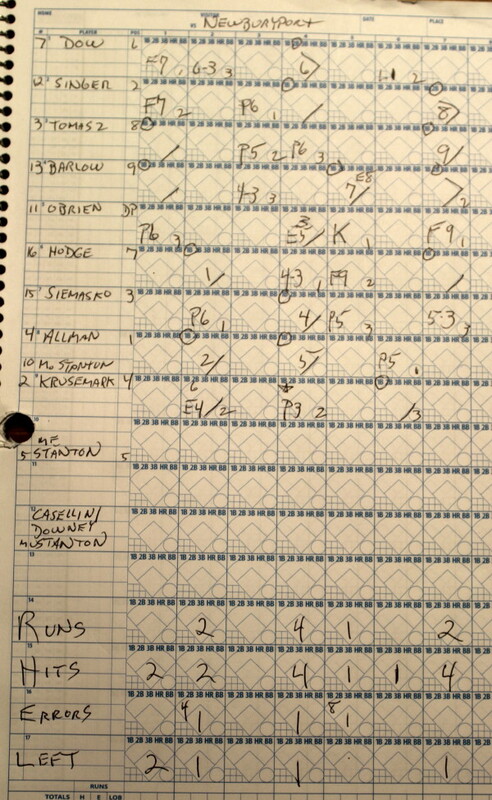 The Indians had an 18-batter, 13-run second inning in that one. 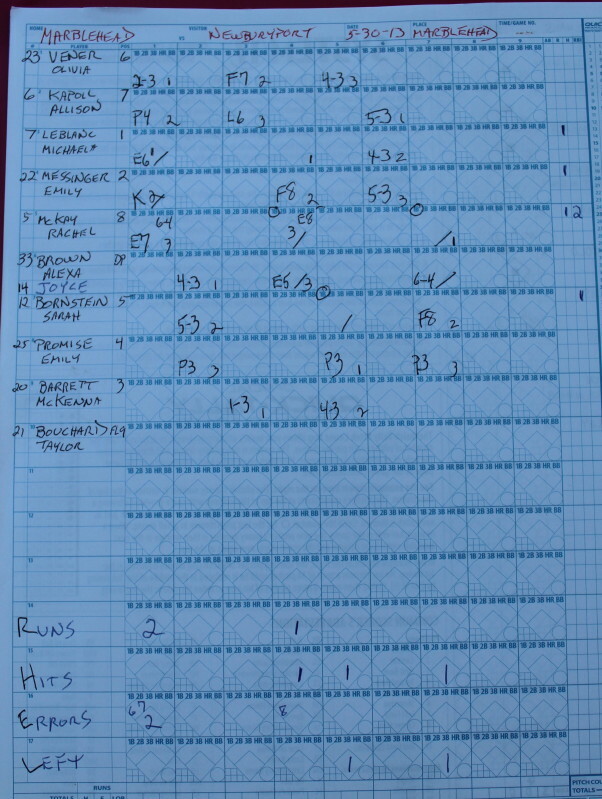 Vicki Allman was hit hard (18 hits) and the Clippers defense was weak. 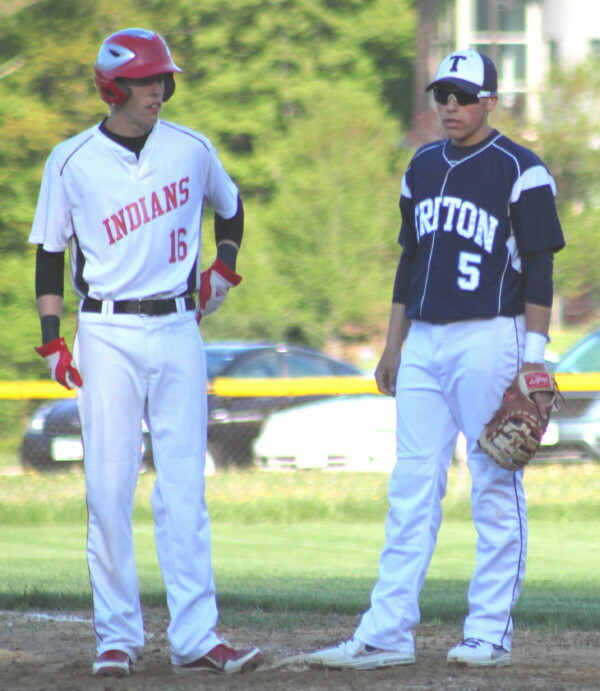 However, the pressure could be on the #2 seed Indians playing at home. The game is sure to be interesting. 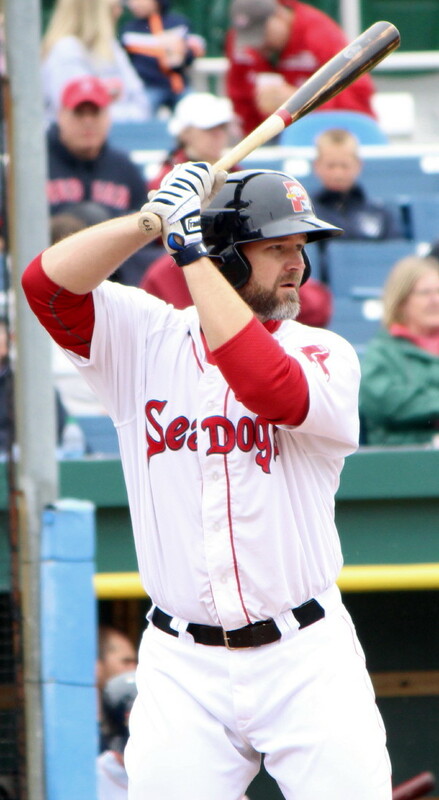 (Portland) Third straight win for the Sea Dogs as they defeated New Hampshire, 8-4, on a Thursday morning/afternoon Eastern League game. 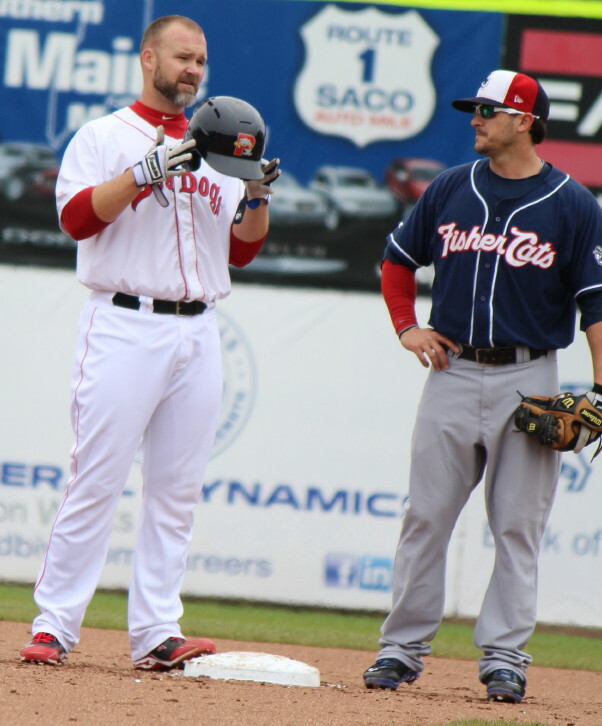 The treat for the 4,622 attending was that two Boston Red Sox players (Franklin Morales and David Ross) were rehabbing with the Sea Dogs. Portland (27-18) is currently at the top of the Eastern League East with a two-game lead over the Binghamton Mets. The Sea Dogs have gone to Binghamton (NY) for a weekend series. 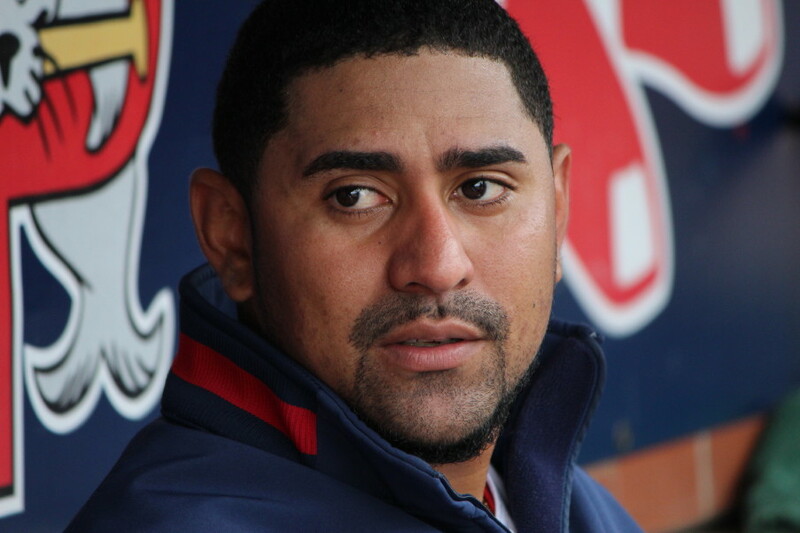 The announcement that Morales and Ross would be playing came late. I was geared to take a look at Portland pitcher Anthony Ranaudo. 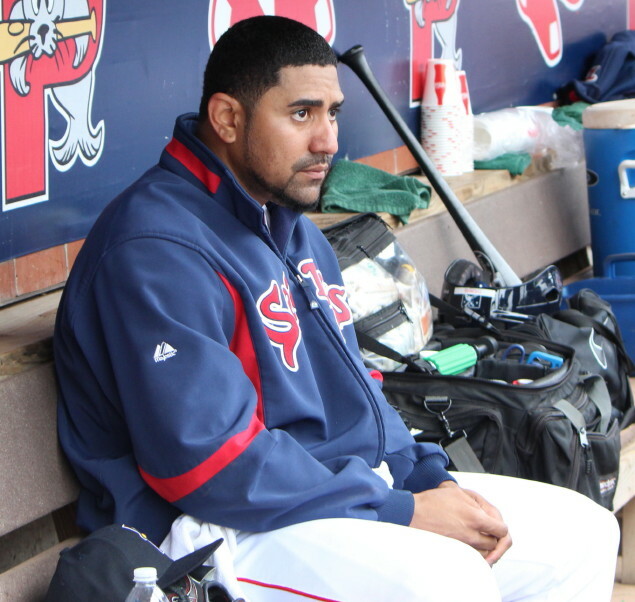 Anthony has pitched well enough in 2013 (5-1/1.67 ERA/0.91 WHIP) to deserve a promotion to Pawtucket before too long. I anticipated a small turnout at Hadlock Field. An 11AM start on a Thursday with overcast conditions drove that point of view. I realized the error of my thinking when I saw 30 (?) school buses lined up outside the stadium. The students were entertained and talked to for about an hour before the game. As part of the education segment, a lady involved with science launched a rocket. Something about that activity always gets me a bit nervous when I think of something like that being tried by one of these school kids when they get home. 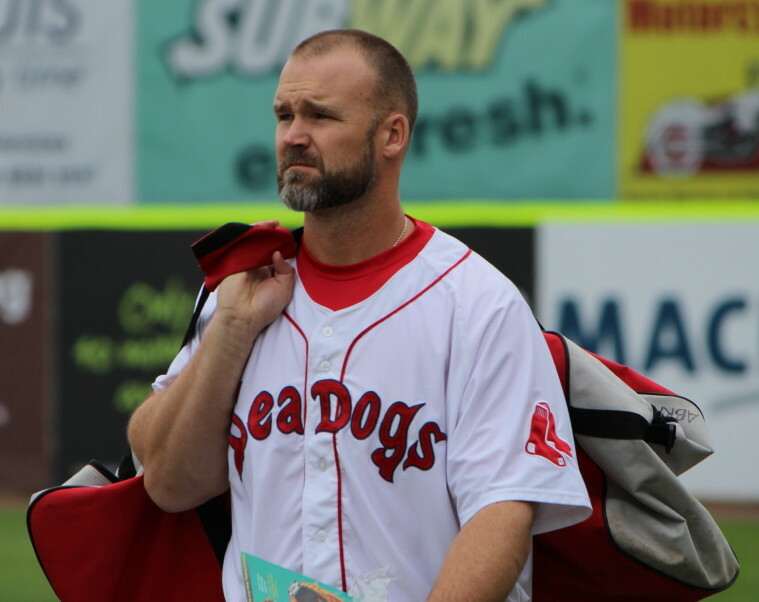 Catcher Dave Ross told the Press Herald that he had to borrow a glove from Jason Varitek for the game. 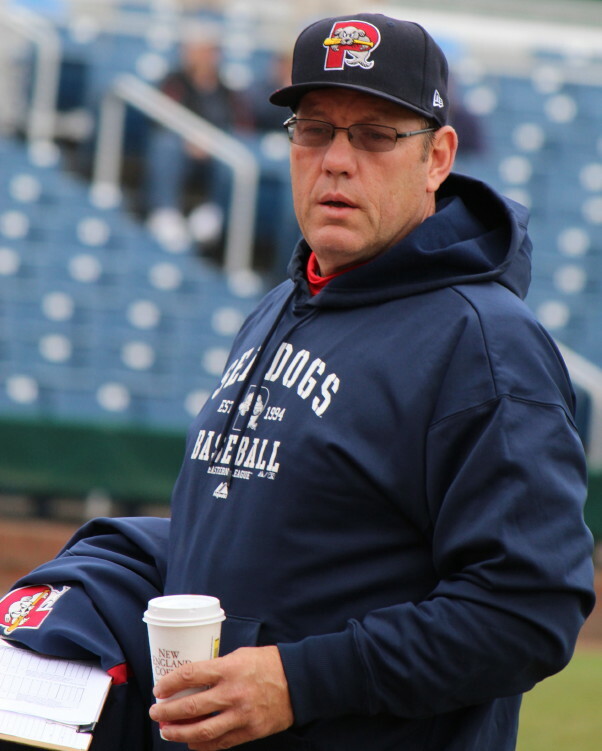 There were two other former Red Sox catchers on the scene – Rich Gedman (Portland hitting coach) and Gary Allenson (New Hampshire manager). Ross (36-years-old) has been on the DL since May 11th after he took a couple of pitches off his mask against Toronto and suffered a concussion. Ross headed back to Boston after five innings were over expecting to be checked out the Boston team physicians. Franklin Morales got the win for Portland. He went five innings and gave up six hits and one run. Franklin (27-years-old) has been on the DL since opening day with a back strain. This was his fifth rehab start. I don’t know if he’ll have anymore or not. I did not see Matt Barnes, the Red Sox’s first round pick in 2011. 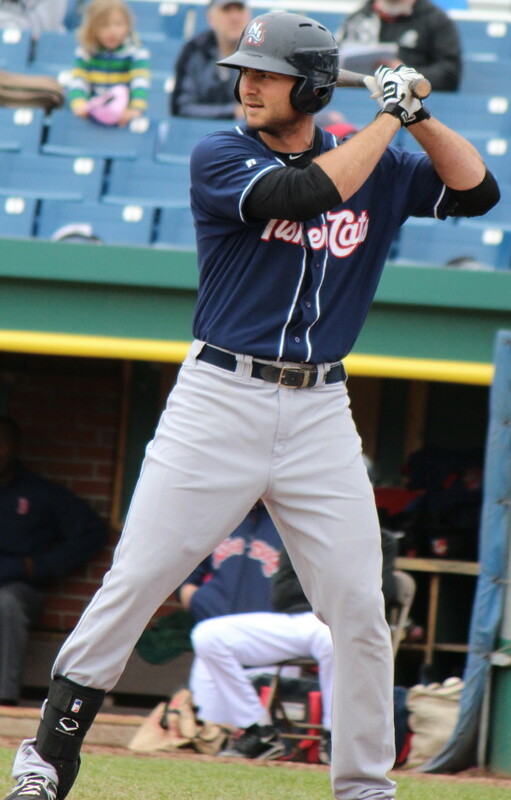 Ryan Schimpf had a big game for the Fisher Cats going 4-for-5. 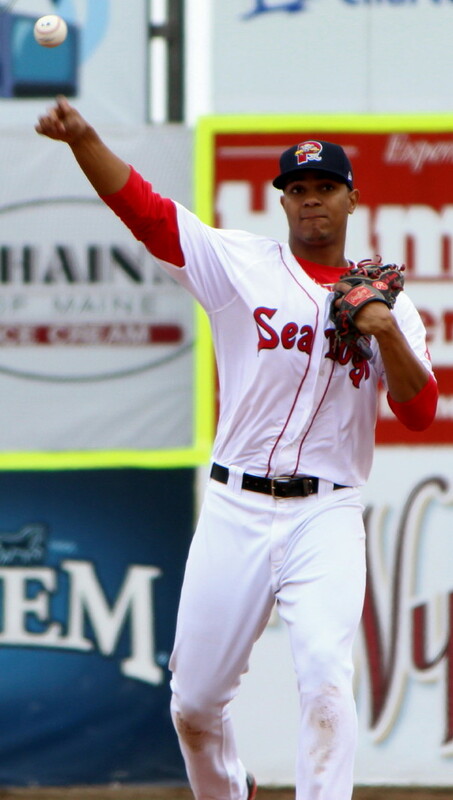 The top player at Portland, in my opinion, is Xander Bogaerts. Young (20) and at the top of his game. Good fielder (shortstop) and an improving bat. Xander had a triple in today’s game. This was my second time seeing New Hampshire. Their top player (again, in my opinion) is Kevin Pillar. 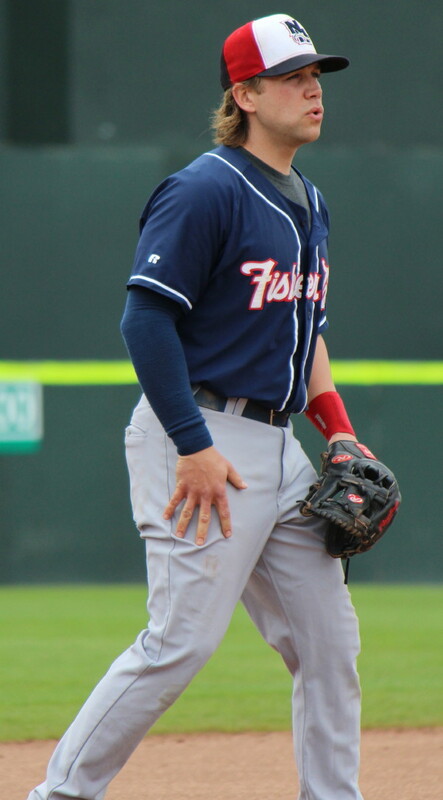 This 24-year-old outfielder plays quality defense and is currently 7th in the Eastern League in batting at .316. 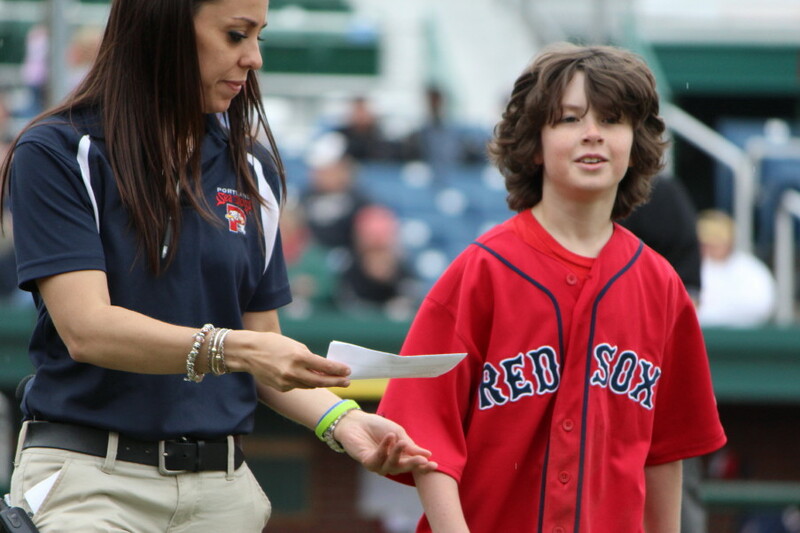 I am again grateful to Chris Cameron (media relations director) for setting up my visit to Hadlock Field today. Chris also puts in time with the Sea Dogs grounds crew. 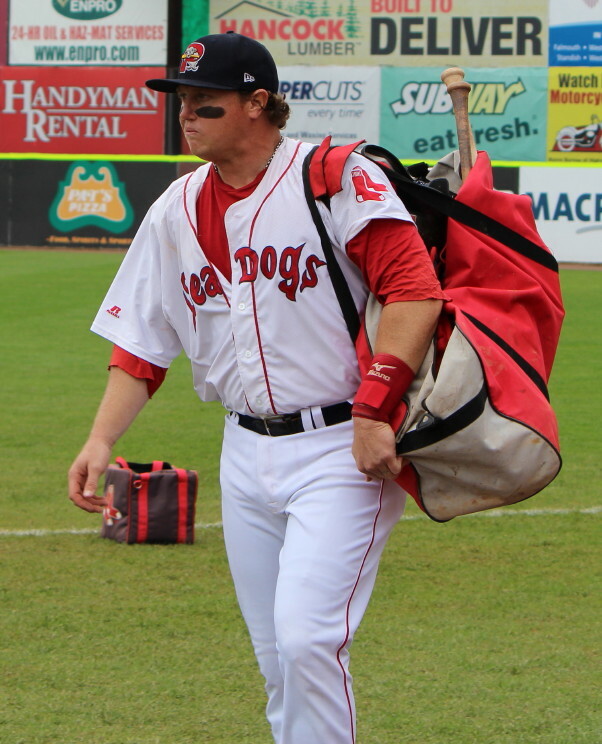 The dugout view that I was allowed to have is the best picture-taking spot at Hadlock. It also can be a bit dangerous. During this visit I had a one-hop grounder come toward me, bounce over my head, carom off the brick behind me, and back onto the field. 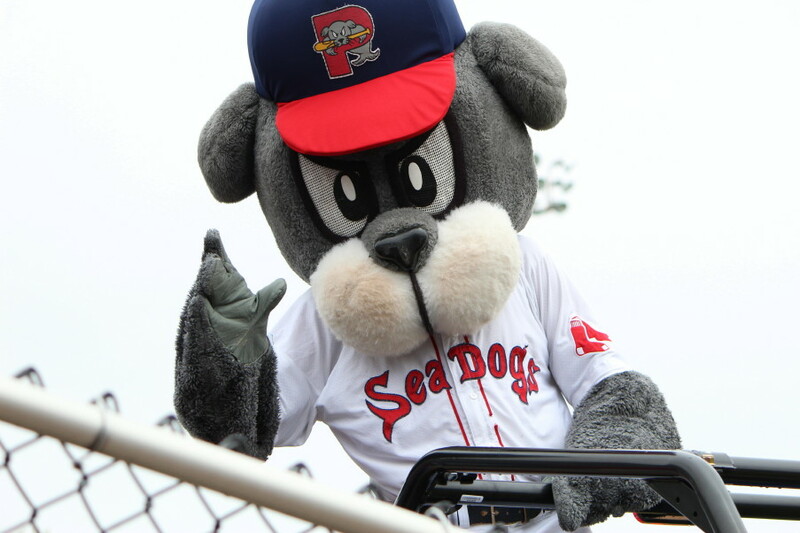 I hope to get back to Hadlock in July. I notice that there is one of those “getaway” games on July 8th. Casey Barlow (3 hits) caught in a rundown. Catcher Julia Hartman waits for the throw as Kendra Dow tries to score. 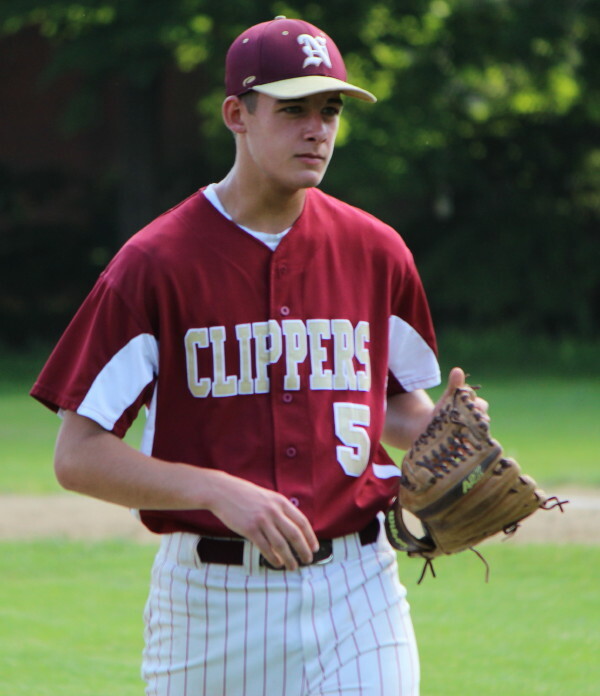 (Salisbury) The Newburyport Clippers scored the last seven runs of the game and defeated Triton, 9-5, at Lions Park on a nice Monday night. 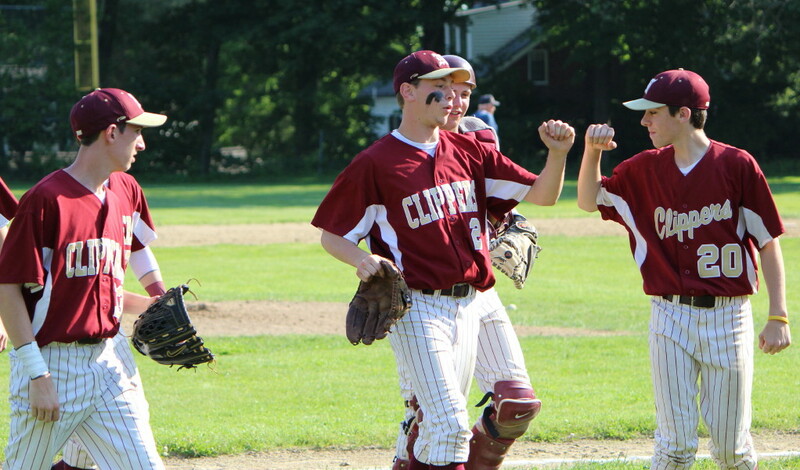 The Clippers (12-5/9-4) have now won six of their last seven games and are still in the hunt for the Cape Ann League Division 1 title. 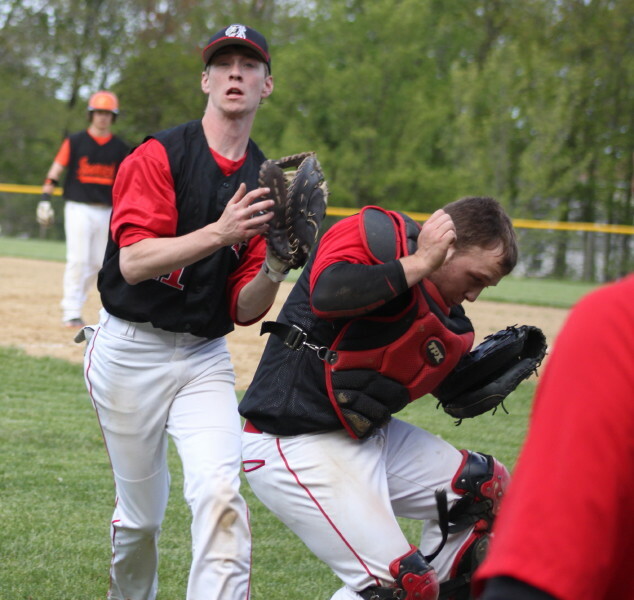 They trail D1 leader North Reading (10-3) by a game and are looking for help from Masconomet which hosts the Hornets on Wednesday. 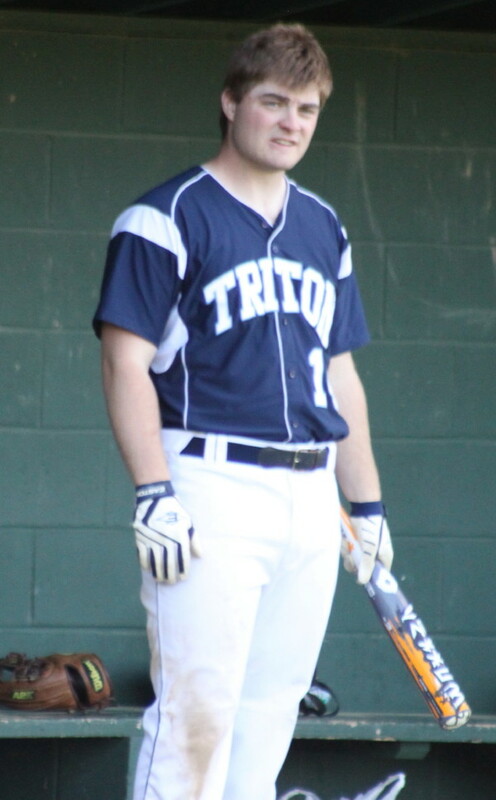 This was yet another tough loss for Triton (7-9). The Vikings have now dropped five straight after being a promising 7-4 not too long ago. 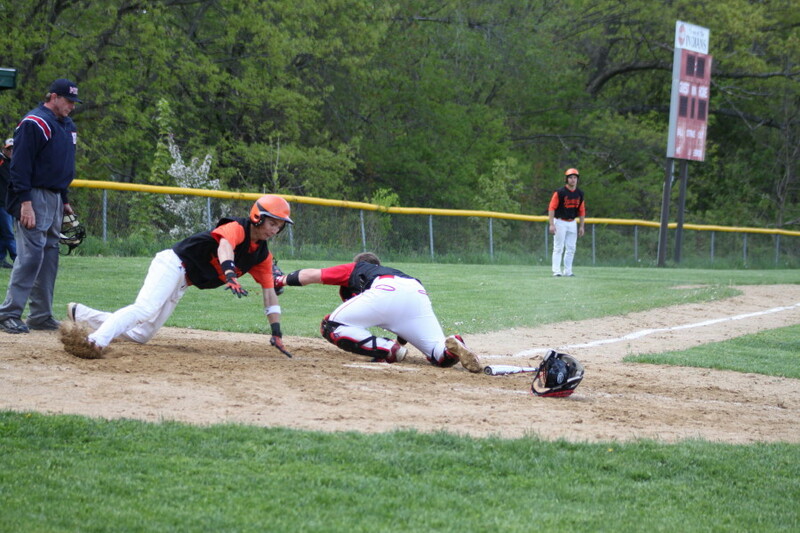 Fielding miscues were the primary culprit in the loss to Newburyport. 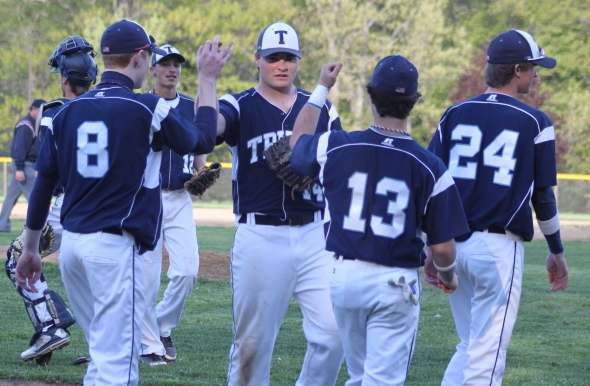 Triton closes its season tomorrow at Manchester-Essex. The Hornets (1-13) won their opening game and haven’t won since. One of the teams tomorrow will be ending a losing streak. The keys to the Newburyport win were clutch hitting and errorless defense. 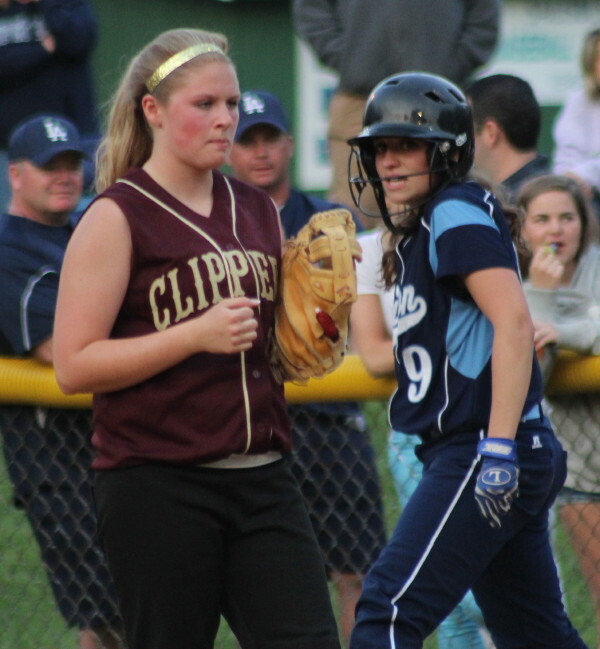 The Clippers rapped fourteen hits off of Triton’s Mara Spears and only left five baserunners. 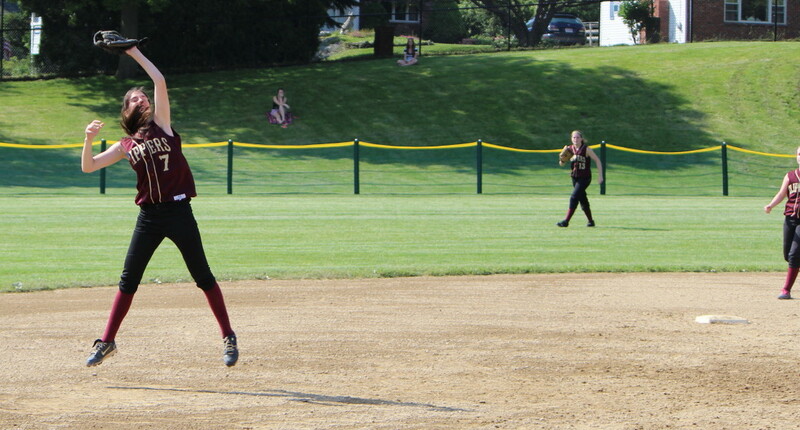 The infield defense of Kendra Dow (SS), Jackie Krusemark (2B), and Carley Siemasko (1B) was flawless. 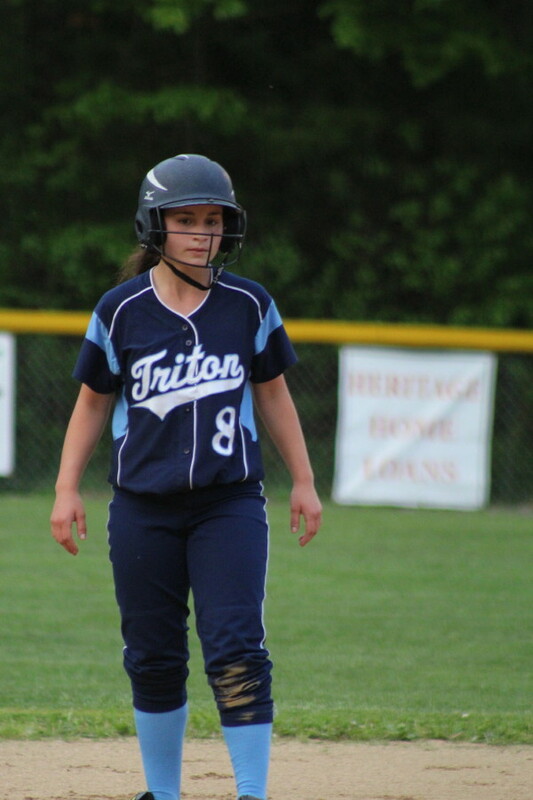 Kendra’s best play and was a catch of Kylie Gilroy’s hard-hit liner that put an end to Triton’s three-run third inning. Carley took care of two potential doubles down the first baseline off the bats of Mara Spears and Kelsey Trudel. The solid Clippers defense enabled pitcher Vicki Allman to retire eleven of the last twelve batters she faced, including nine straight. 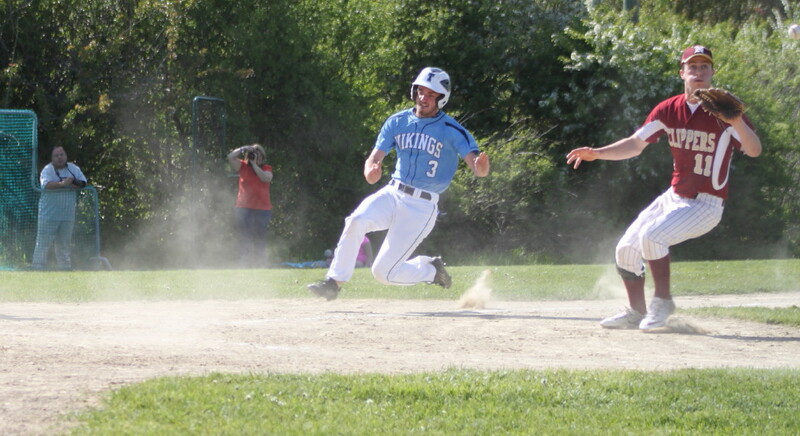 The only Vikings baserunner over the final four frames was Cory Simons. 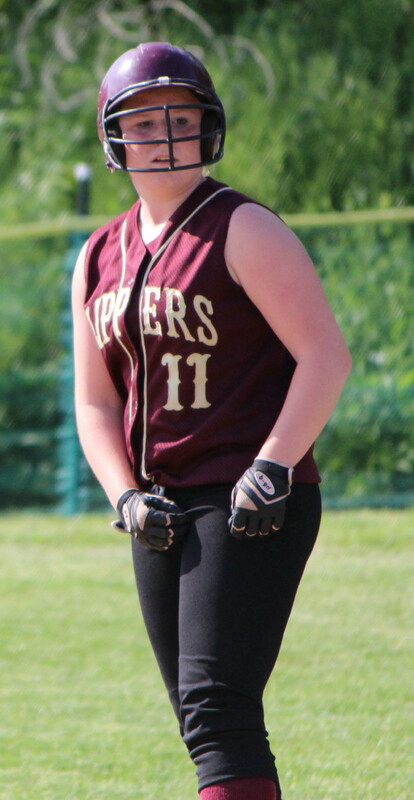 And while the Vikings were held scoreless over the final four innings the Clippers pounded two doubles (Lauren Singer and Casey Barlow) and eight singles collecting seven runs over the final four innings. 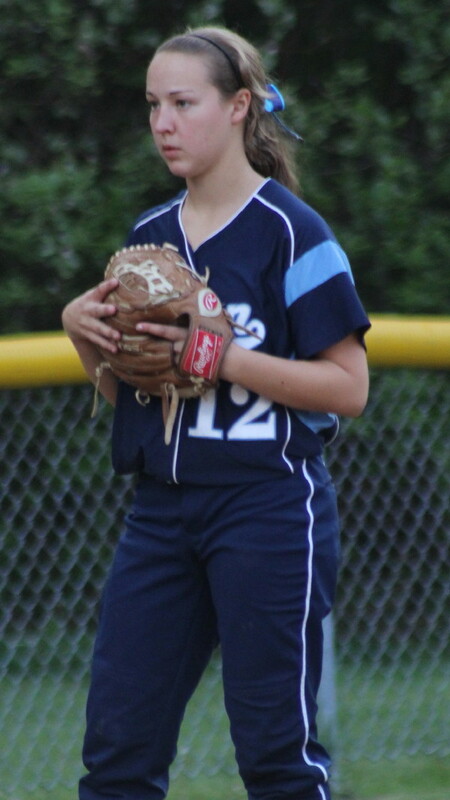 It certainly hurt the Vikings to have #3 hitter Rylee Culverwell leave the game injured in the third inning. Freshman Rylee’s bat was missed the rest of the way as well as her excellent defense at third. 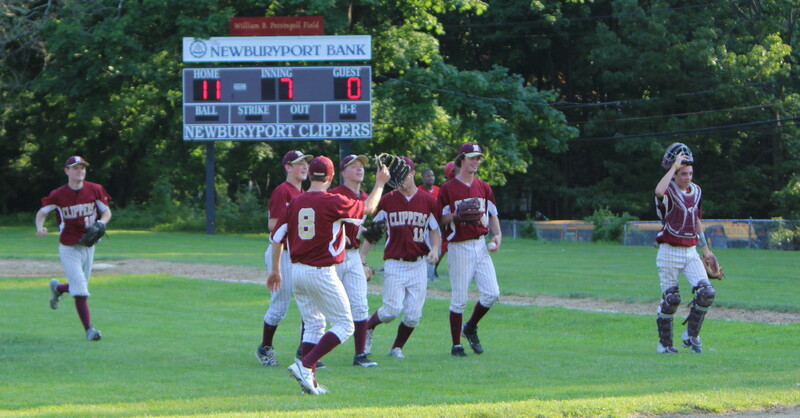 Of the seven, last-four-innings, runs for Newburyport only five of them were earned. A bobble at third (Casey Ross) and a single that turned into a 2-base error (CF Ashley Shute) allowed the two extra runs. 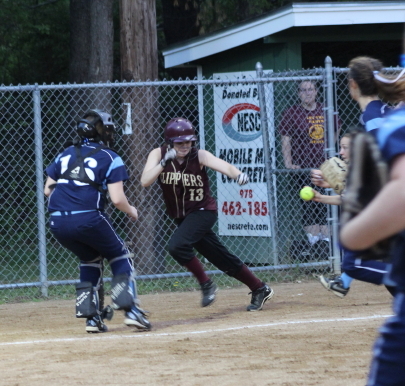 Newburyport opened the scoring in the second inning. Ashley Hodge and Vicki Allman singled and both Ashley and Vicki’s pinch-runner (Molly Stanton) came home on 2B Kylie Gilroy’s two-out error. Triton put together a single (Kylie Gilroy), double (Cara Orlandi), and a single (Julia Hartman) to tie the score, 2-2, in the second. The Vikings jumped ahead by three (5-2) in the third. A double (Cory Simons) and three singles (Rylee Culverwell, Kelsey Trudel, Lily Anderson) were keys. 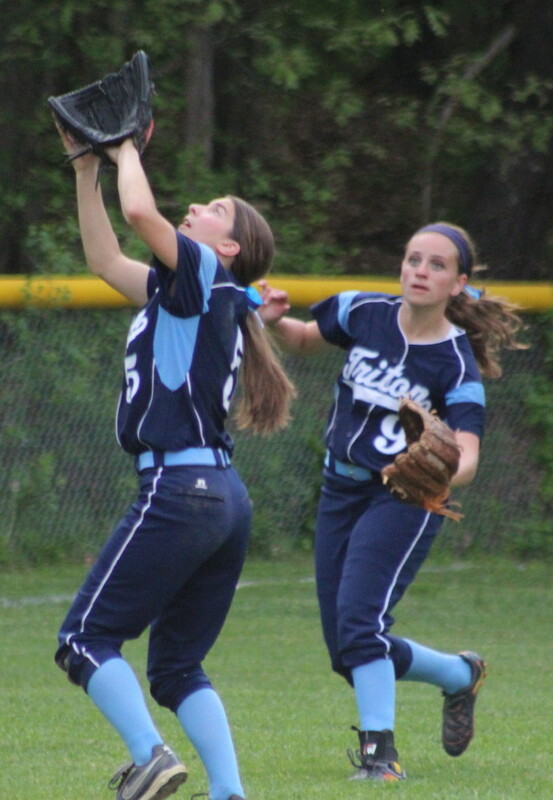 However, the promising inning ended when pinch runner Rachel McCarthy was tossed out trying to steal and the next batter’s line drive was taken by NHS shortstop Kendra Dow. 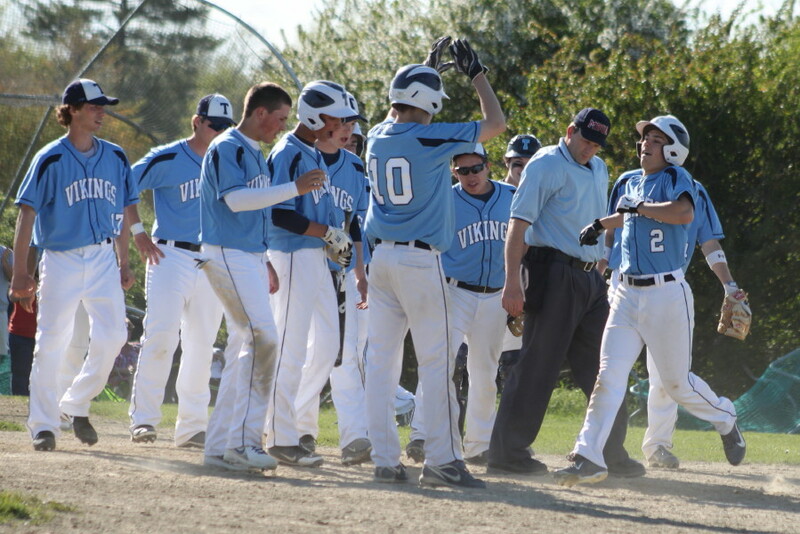 The Viking would have only one hit the rest of the way but at the moment they had a 5-2 lead after three innings. 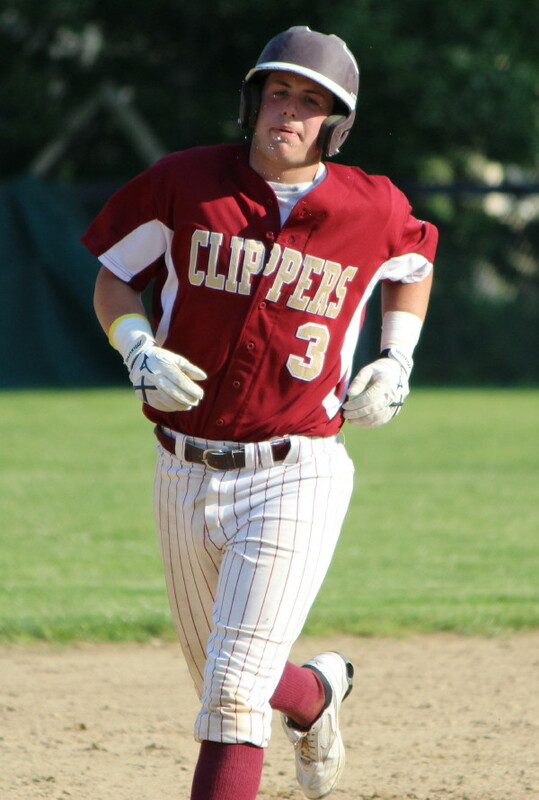 Newburyport pulled ahead for good with four runs in the fourth. A big hit was Kendra Dow’s two-out double to the CF fence driving in a pair. In the fifth, Casey Barlow (3 hits) hit a rope to center and reached third with no outs when the ball skipped by CF Ashley Shute. 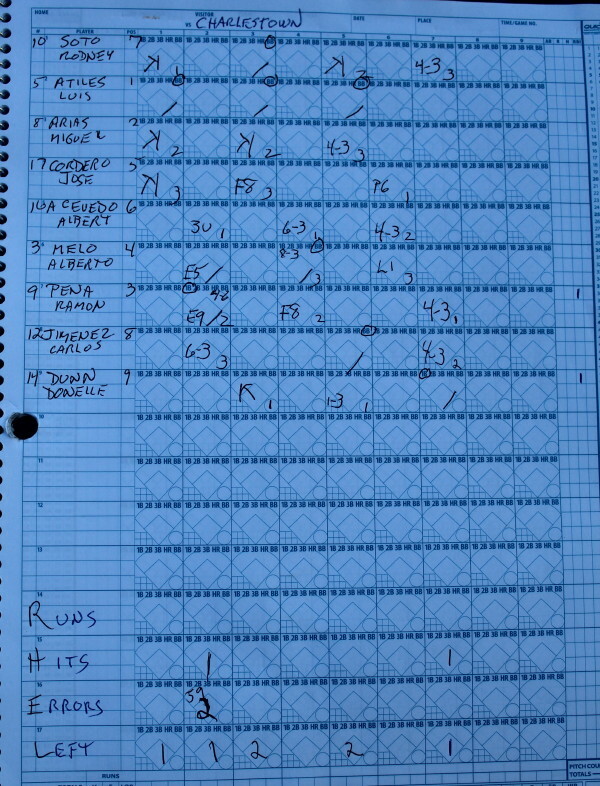 Ashley Hodge’s sacrifice fly delivered Casey with the Clippers seventh run. 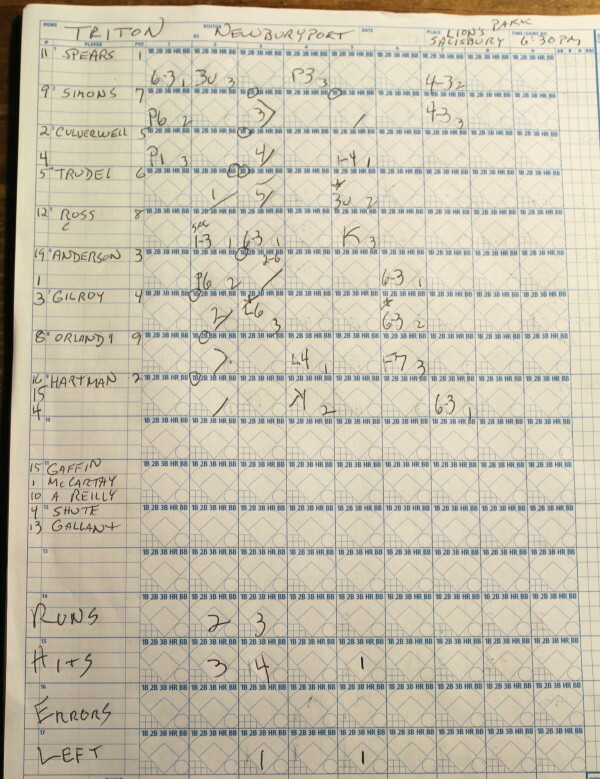 Newburyport added to its 7-5 lead with two more runs in the seventh inning. The Clippers went double (Lauren Singer), single (Lea Tomasz), double (Casey Barlow), and single (Ashley Hodge) to get the pair of runs. 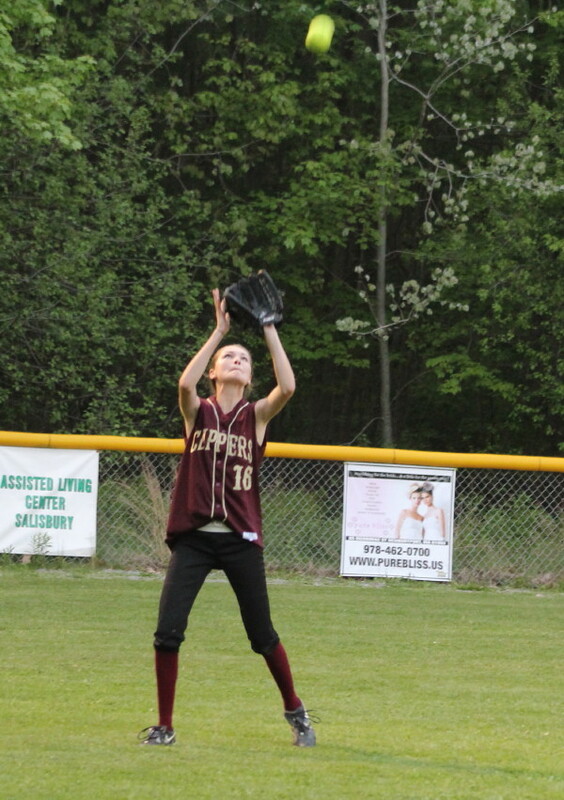 Lily Anderson made an excellent play on a foul popup in the fourth inning. Rylee Culverwell had her right arm in a sling afterwards. 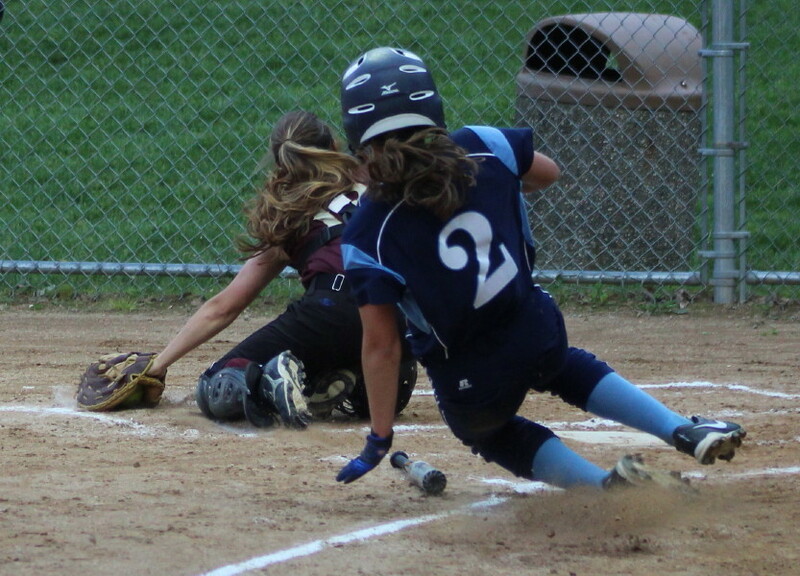 I believe that her injury occurred when she slid home scoring Triton’s fourth run. Casey Barlow paced the Newburyport hitters with three. Lauren Singer, Lea Tomasz, Ashley Hodge, and Vicki Allman had two hits each. 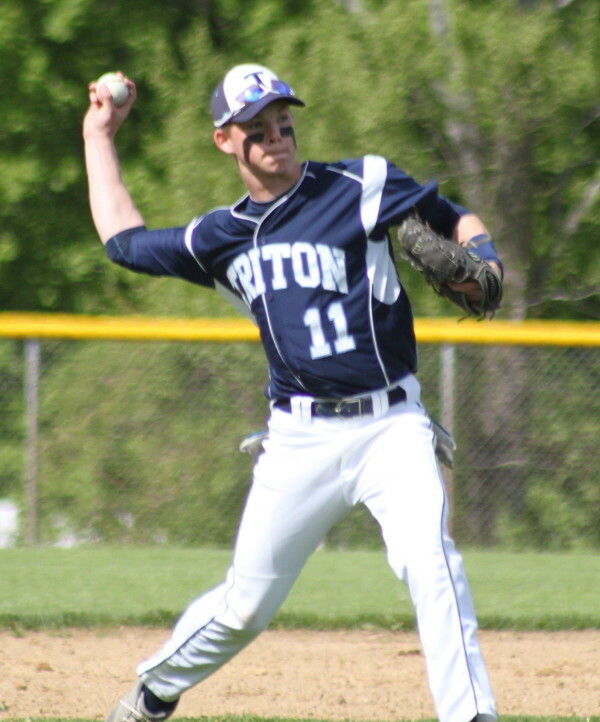 Senior Cory Simons led Triton with two hits. Teammate Kelsey Trudel scored two runs for the Vikings. Both of these quality players will be suiting up for their last game tomorrow. Lions Park was a nice setting. The infield was smooth and the outfield was green. One of the bank of lights went out in the seventh inning but most of the fast-paced game was played in daylight. 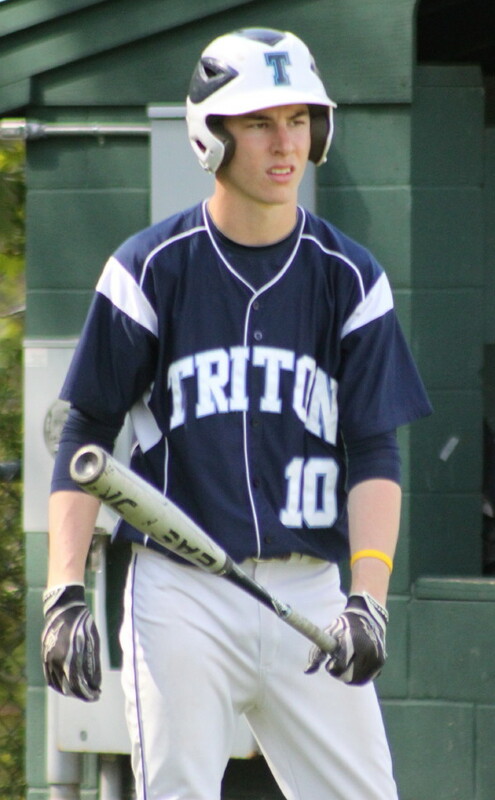 Triton is a team that certainly has had some highs and lows. They are the only team to beat Amesbury (4-3). They defeated Newburyport the last time they met. But then there’s the loss early in the season to 2-12 Ipswich. 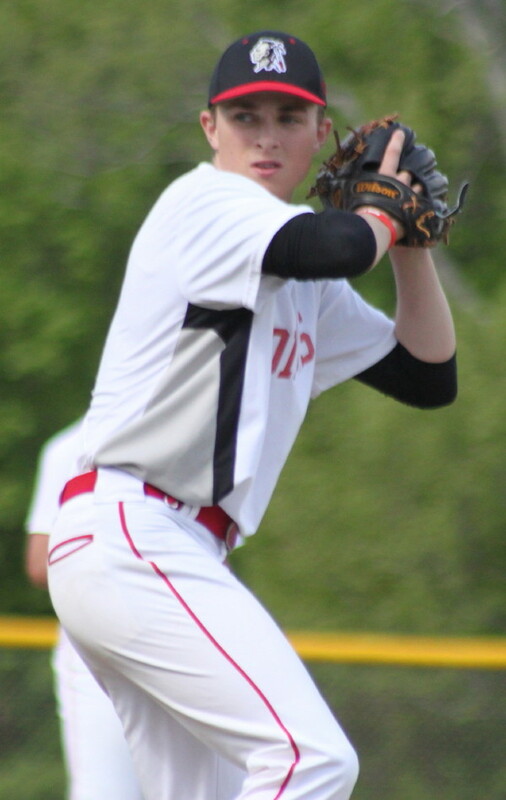 Sean Whooley pitched a 2-hitter, had two hits, scored a run, and drove in a run. (Amesbury) In years to come, when the talk around the water cooler turns to the Ipswich Tigers’ 2013 season, I strongly suspect that their games with Amesbury will get mentioned. Why? 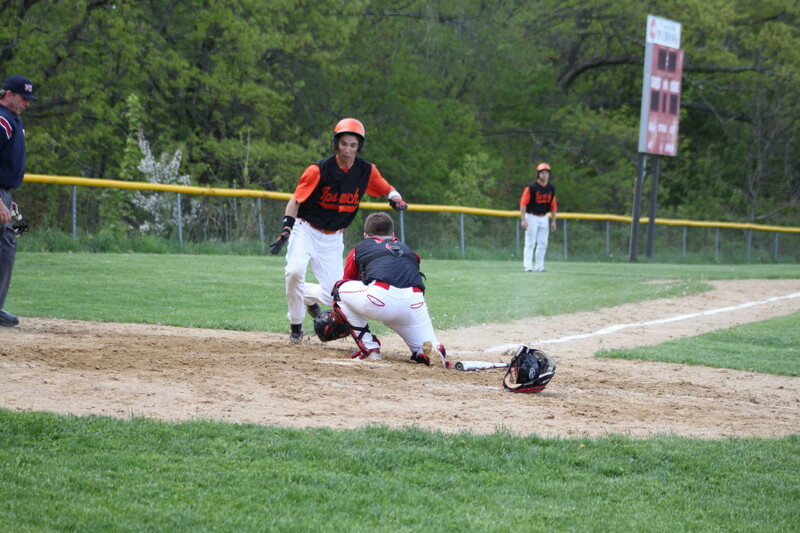 The Tigers defeated Amesbury twice and didn’t allow a run in either game. 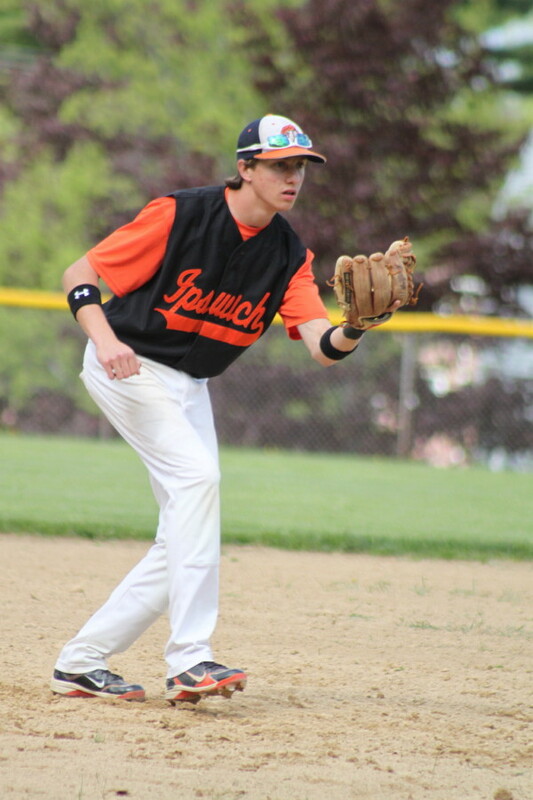 Today, was the second win as Ipswich (4-10) put pitching, hitting, and defense together in a perfect package and shut out Amesbury, 4-0, on a cool Tuesday afternoon of Cape Ann League baseball. 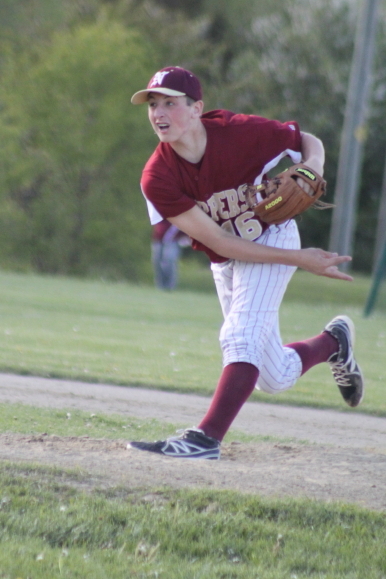 Ipswich starter Sean Whooley allowed just two hits (Zack Fitzgerald and John Pesci) picking up his second victory of the season. Sean struck out just one batter so the outs were made in other ways. 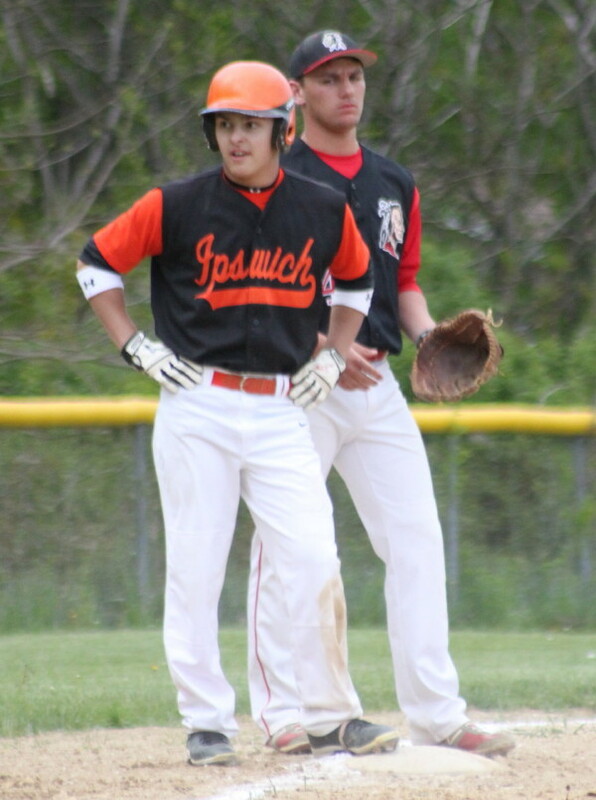 On this day, the Ipswich defense made numerous big plays highlighted by a run-saving stab by leftfielder Ryan Silva in the corner off Mac Short in the Amesbury sixth. 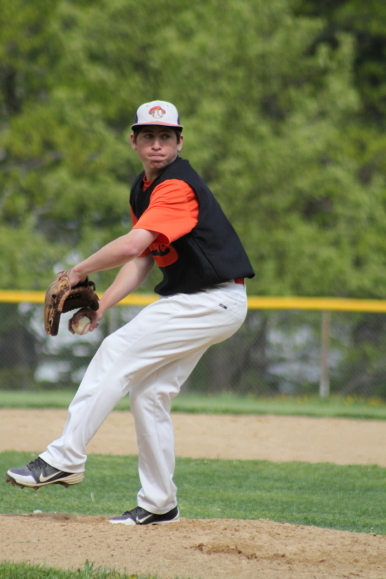 The Tigers collected ten hits off of Amesbury’s first-time starter Devlin Gobeil getting at least one in every inning. 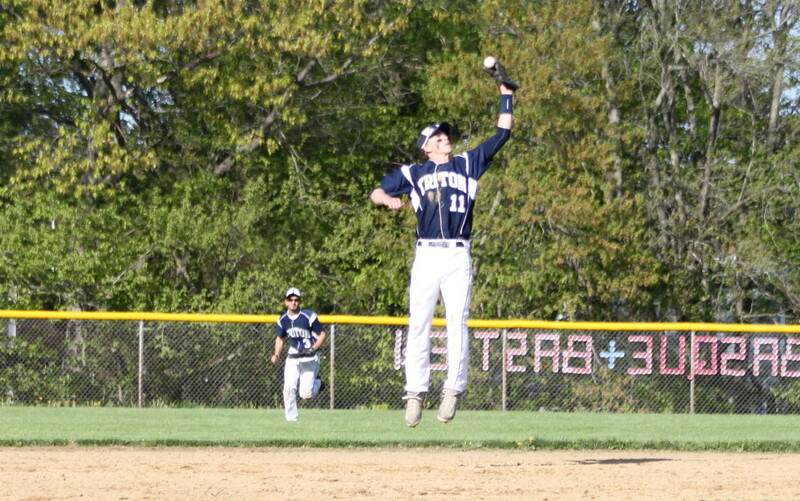 Josh Guertin, Sean Whooley, and Austin Rubino each had two hits for the visitors. 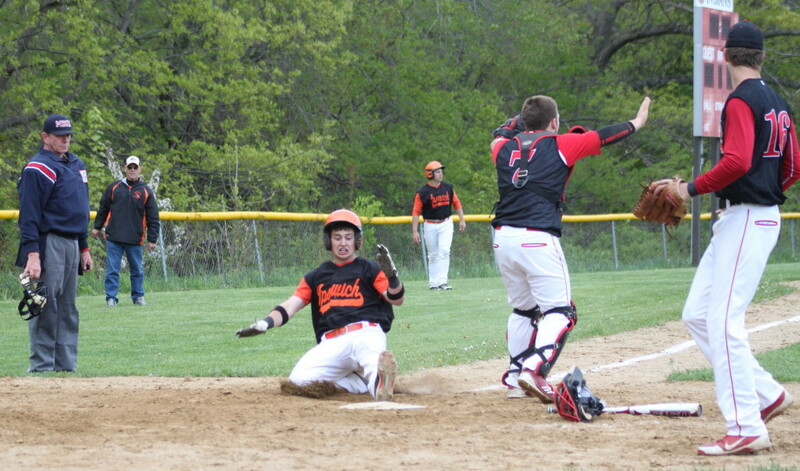 Ipswich scored its first run in the second inning. Austin Rubino doubled to left with one out and came home on Eric Gongas’ single to center. 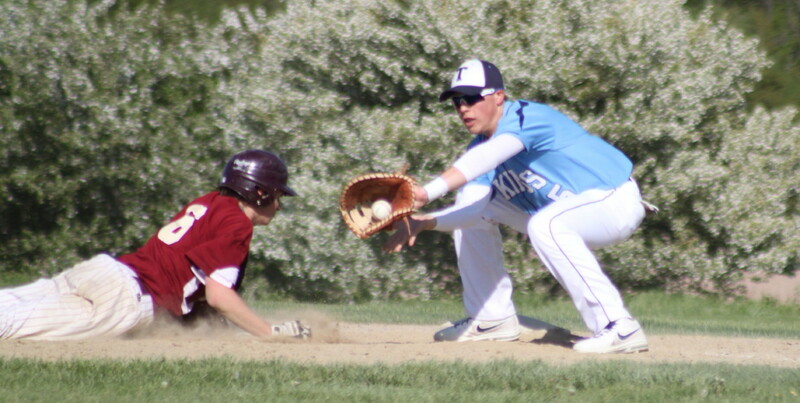 In the fourth inning, Sean Whooley singled, stole second, and reached third on a wild pitch. Ryan Law drove Sean home with a bullet single to center. Despite all the hits, Sean Whooley’s pitching, and the tight defense, the Tigers lead was only, 2-0, through six innings. Let’s toss a cliché’ out here: it was still anyone’s ballgame! But in the seventh Ipswich added two more runs. Josh Guertin was hit by a pitch with two outs. 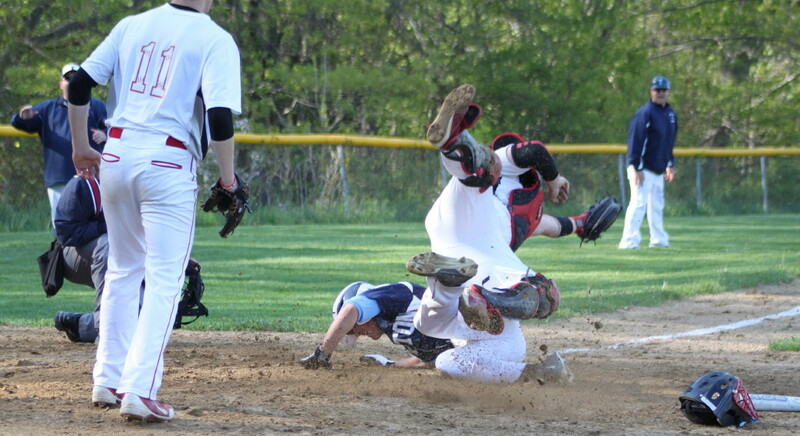 Josh then stole second and came home on Kyle Barber’s double over John Pesci’s head in rightfield. Sean Whooley singled to left bringing Kyle Barber in with the fourth Tiger run. 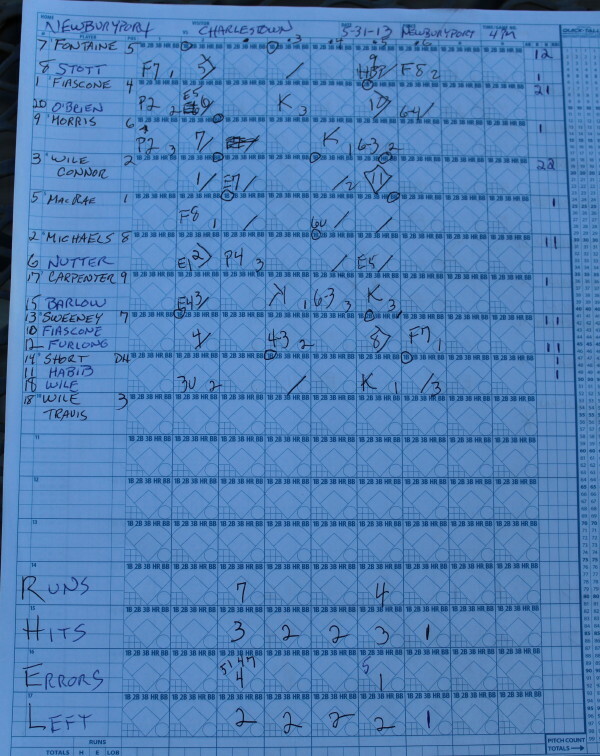 That four-run lead held up through the Amesbury seventh. 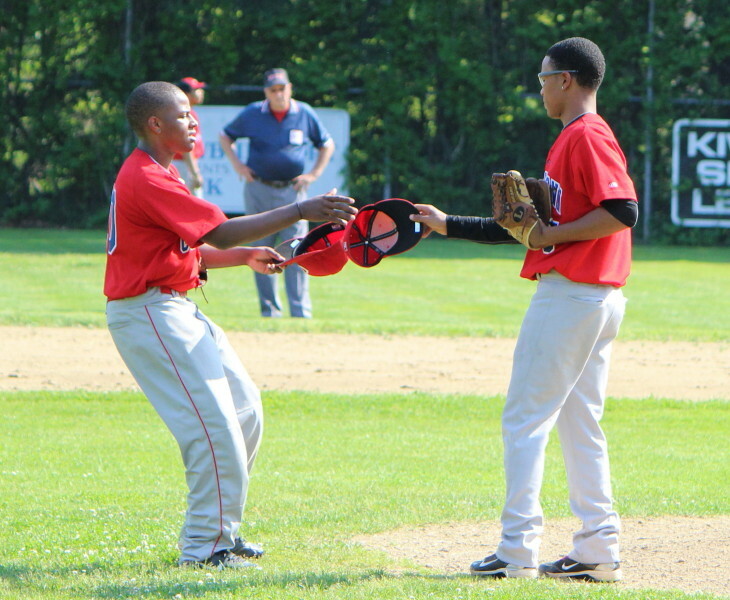 Amesbury (7-8) hit the ball hard a couple of times with nothing to show for it. 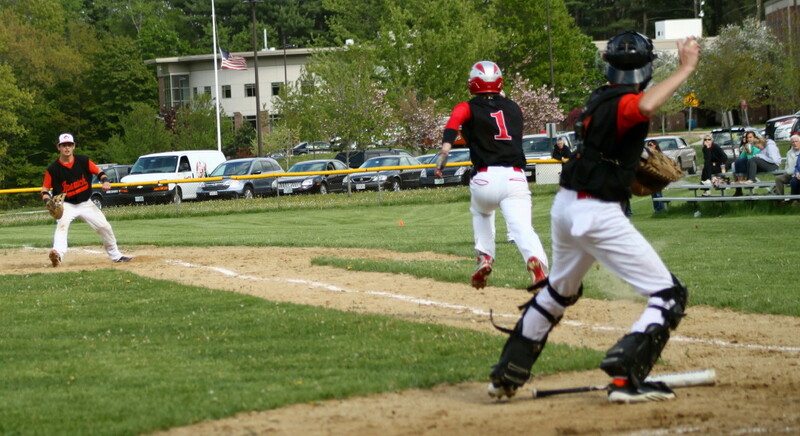 Devlin Gobeil nearly reached the fence in straightaway center in the second but Ryan Law tracked it down. Twice the Indians lined to third baseman Josh Guertin. One of those line drives turned into a double play. 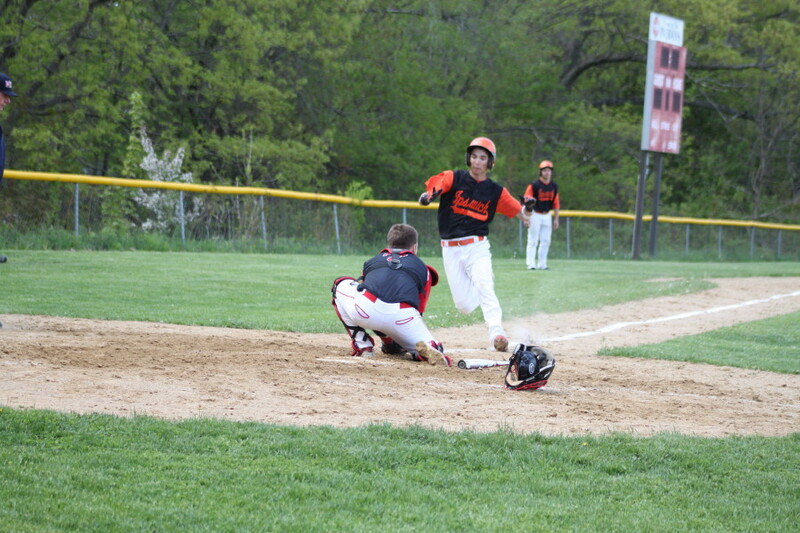 The heartbreaker for Amesbury, however, was Mac Short’s rope in the sixth. 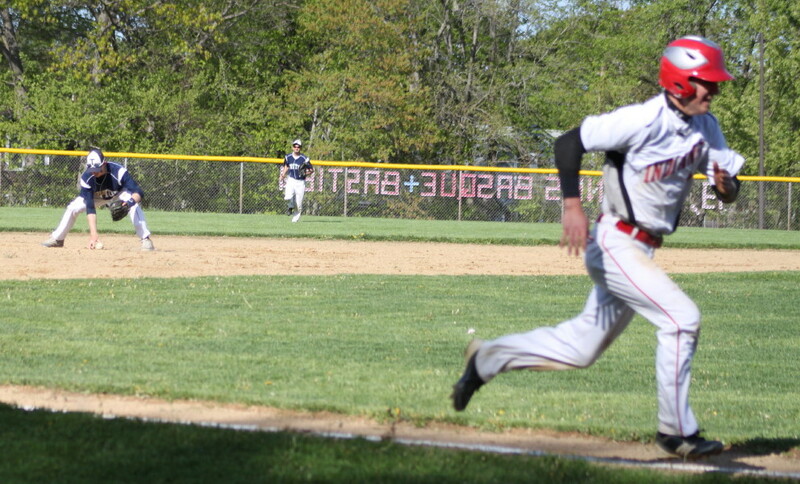 Tommy Connors was on first with two outs when the Amesbury catcher lasered a ball toward the leftfield corner. Ryan Silva had a great jump on it and stabbed it near the 344-foot sign to end the inning. If that ball lands, Tommy Connors would have scored and Mac Short would have been on second. The score would have been, 2-1, instead of 2-0 with the inning over. Sean Whooley has now allowed two earned runs in nineteen innings. For those doing the ERA math at home: earned runs (2) divided by innings pitched (19) times nine, means that Sean’s current ERA is 0.74. That is awfully good! 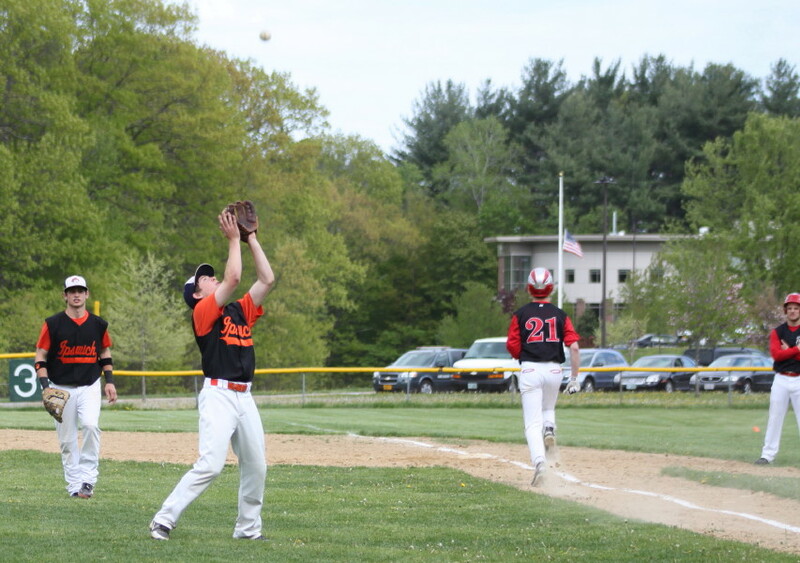 In the first Ipswich/Amesbury game, the biggest play in the Tigers win was a seventh inning, game-ending catch in leftfield by Dan D’Agostino off the bat of, you guessed it, Mac Short. 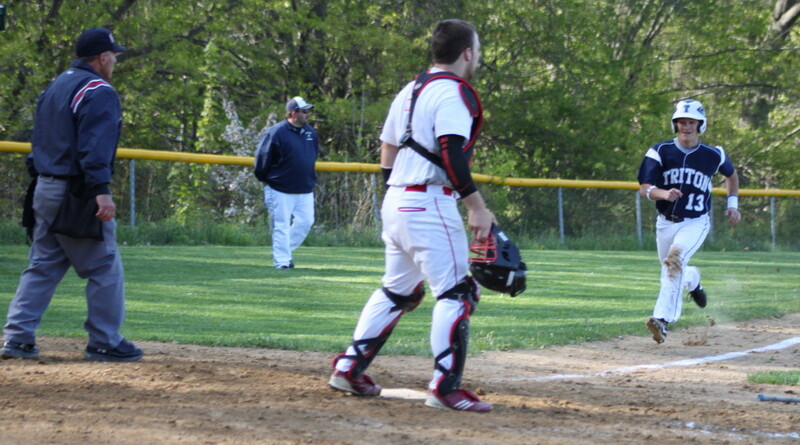 Ipswich catcher Henry Sacco had his left arm in a sling. 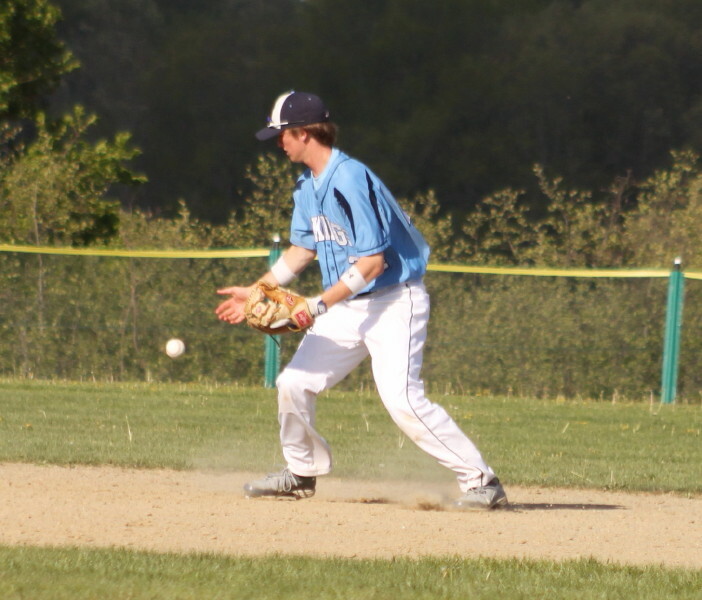 He injured the shoulder sliding into second in the Hamilton-Wenham game on Monday. 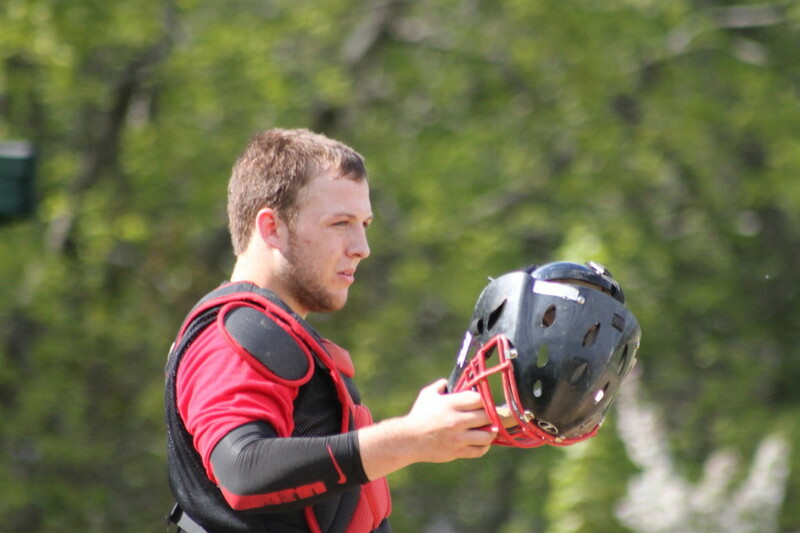 Eric Gongas was the catcher for Ipswich in today’s game. The Tigers have now won two straight after losing six straight and will face Rockport at Rockport on Thursday. 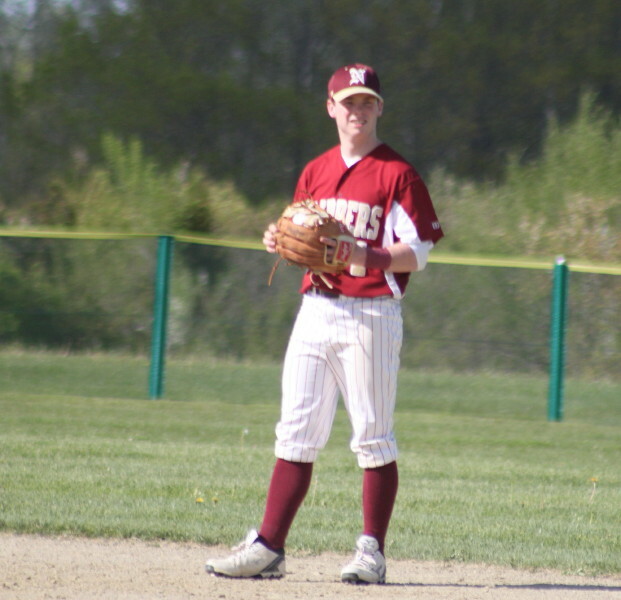 Amesbury will look to end a two-game losing streak at Manchester-Essex on Thursday.